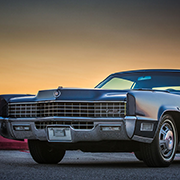 Underbody | Geralds 1958 Cadillac Eldorado Seville, 1967 Cadillac Deville,1967 Cadillac Eldorado, 1971 Lincoln Continental Mark III and 1978 Cadillac Eldorado Biarritz. A project that kept me busy for the last few months was to bring back our "new" Roadmaster to its former glory. The car has only 23k miles on the odometer and in many areas still looked like new. 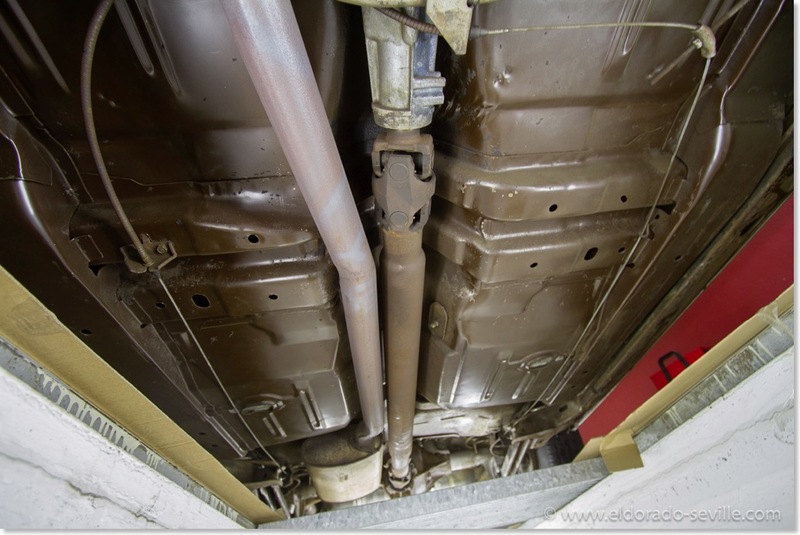 The undercarriage was not protected very well from the factory and like on all cars had developed some surface rust over the last 2 decades although the car never was stored outside nor regularly driven in the rain. It also never saw road salt or snow during its entire life. Below are some before pictures where you can see the fantastic condition the car was in before I started cleaning it up. 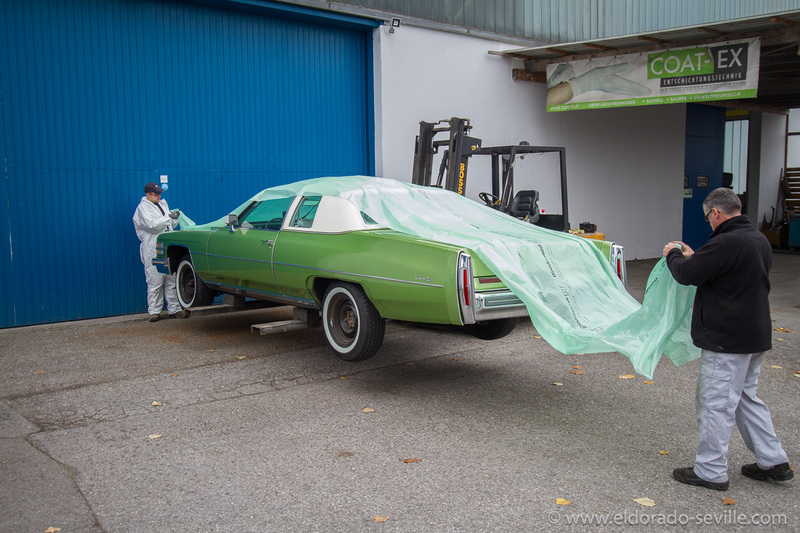 This is how the car looked like after dry ice cleaning. 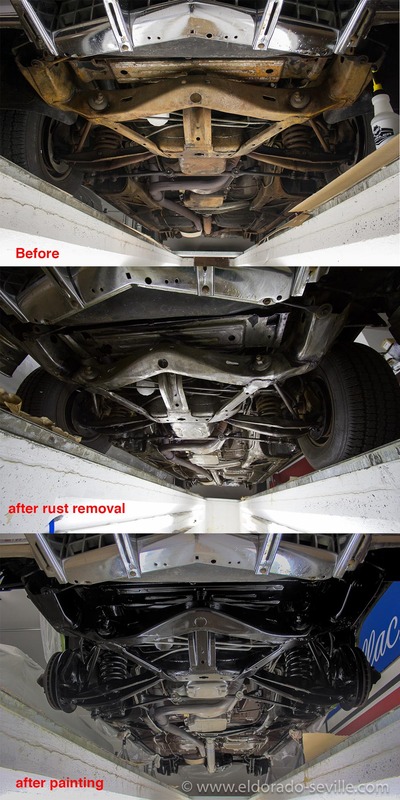 I have now set up a system where I can spray rust remover liquid onto the rusty parts on the undercarriage permanently. 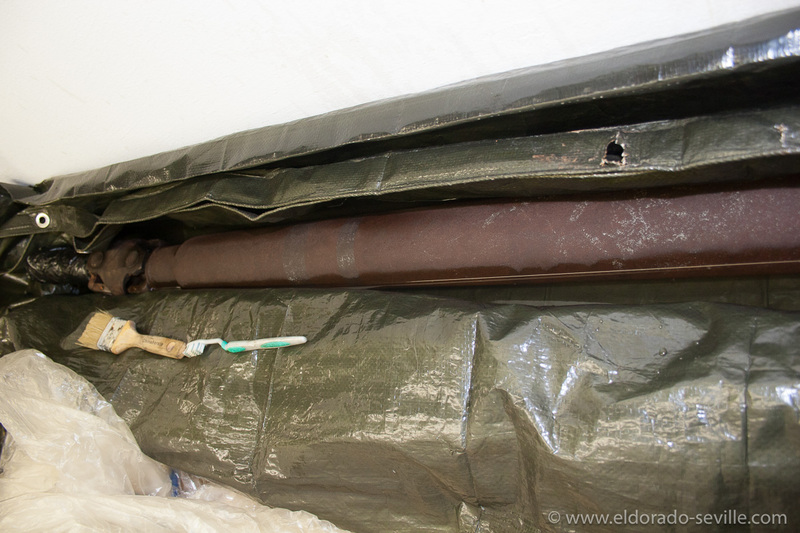 I´m using a recirculating pump to spray on the rust remover which is then dripping onto a plastic cover. From there it will flow back into a large bucket where the pump is in and recirculates the fluid back onto the car. I´m using a german product called "Rostio" - it's a concentrate used for de-rusting fuel tanks. You have to mix it with hot water. I have also heard great things about Evapo Rust. I let my system run for days until all the surface rust was gone. 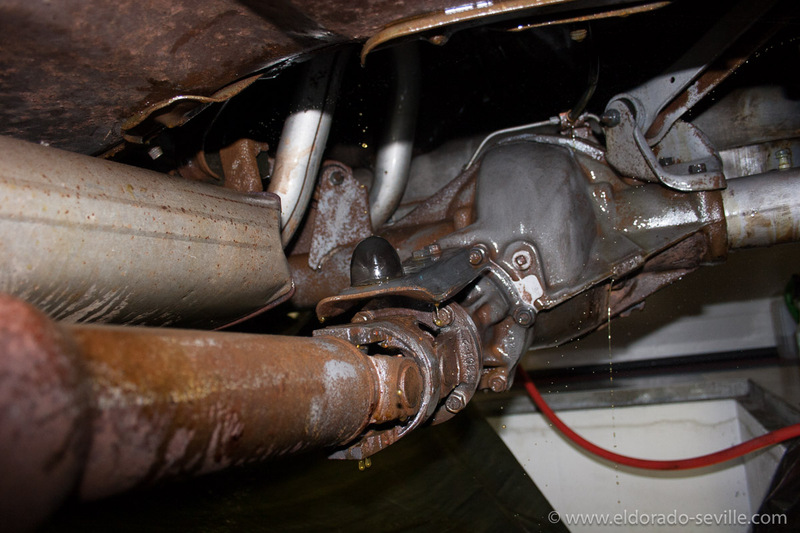 The advantage is that the liquid can now get everywhere and should remove the last little piece of rust. You will be surprised how well this works. This area now looks like a new car. 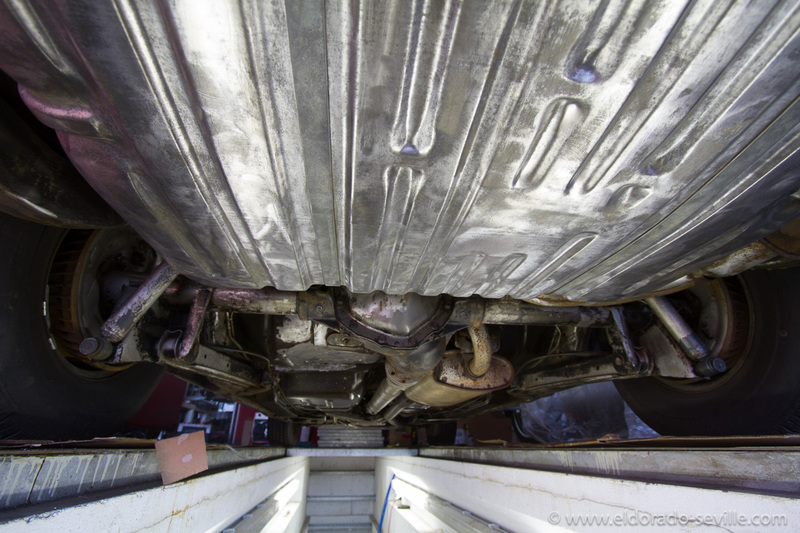 There is not the slightest trace of rust to be found after 12 hours of spraying the car. After spraying it with the rust remover you then have to flush it with water thoroughly and then dry it properly to avoid flash rust. I also used various wire brushes and other abrasive materials to remove rust and strip bad paint. I simply used a garden hose and shower to spray the rust remover on. As you can see it only leaves rust free metal behind - I always let it run for 2 - 12 hours - depending on the amount of rust that had to be removed. 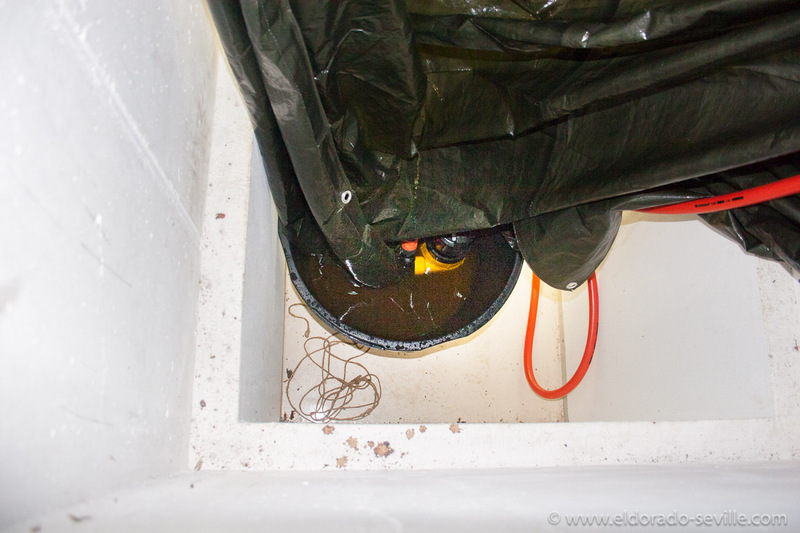 The liquid is collecting in the big bucket where I put the pump in to recirculate it. 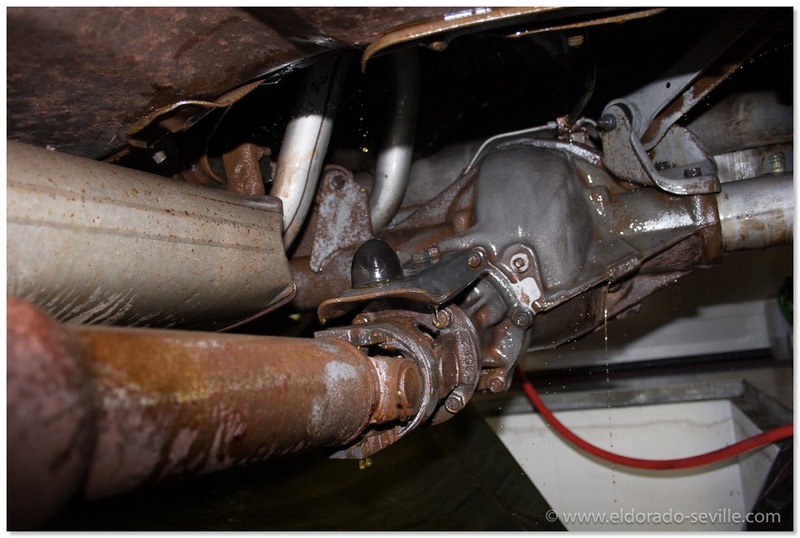 After cleaning - the brake cylinder developed flash rust immediately again. 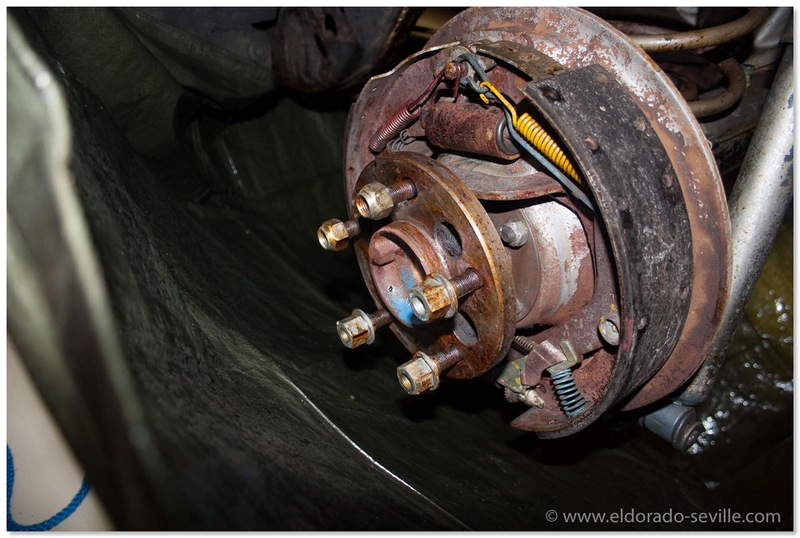 The liquid also works great on brake drums - the original factory markings were still there. Cleaned the wheelhousings as well - stripped all the paint in there as well. 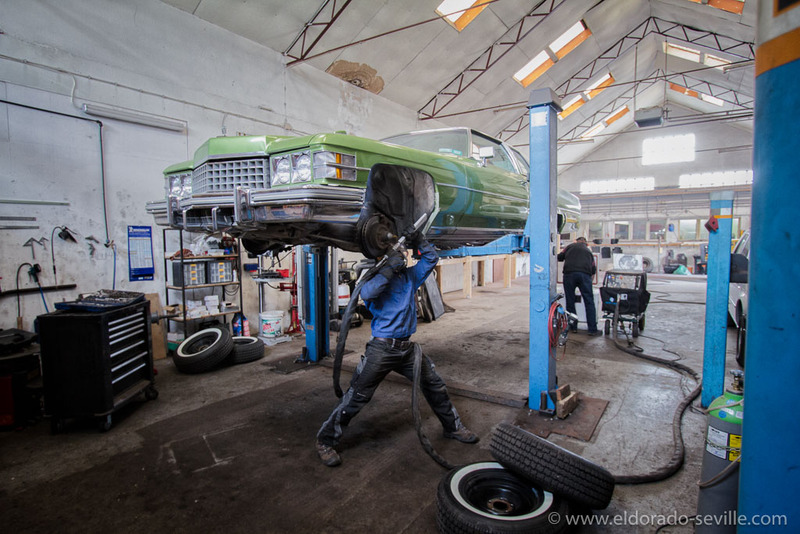 The cleanup of the undercarriage of my low mileage, all original 74 Coupe deVille turned into a big project, which almost took a year instead of only a few weeks. 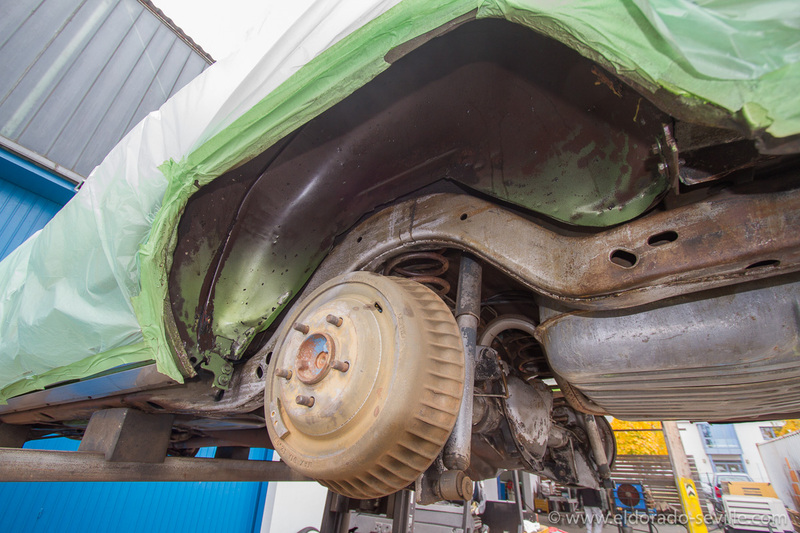 The goal of this project was to remove all the surface rust, clean everything up and paint it in the correct colors again. For the ultimate, invisible protection I applied transparent undercoating from "Timemax" and transparent stone guard to the wheel housings. 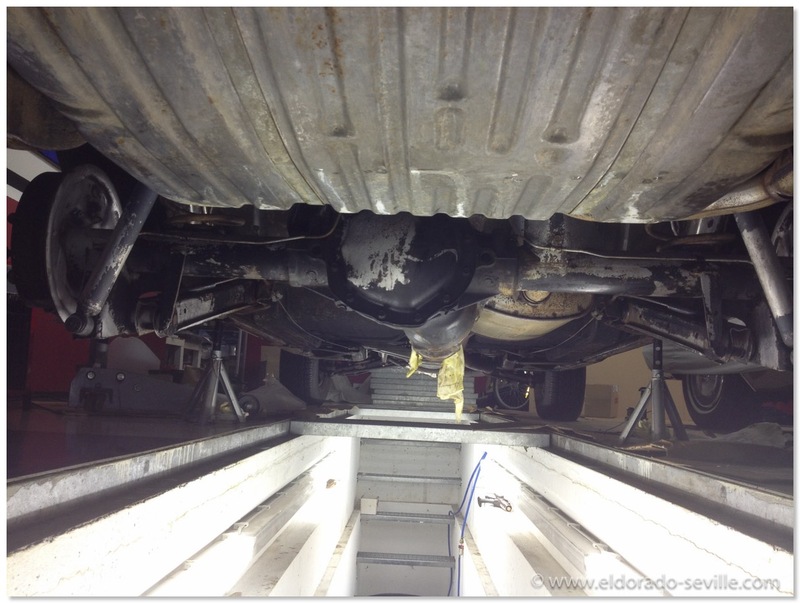 It was very important for me that the car looks as original and as perfect from the underside as the rest of it. 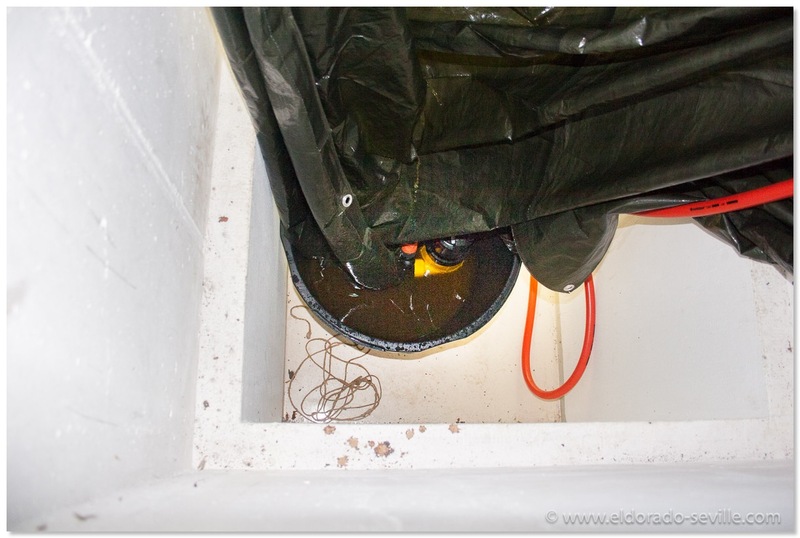 You can read reports about what I had to do by clicking here. You can also see all the restoration pictures in this gallery. 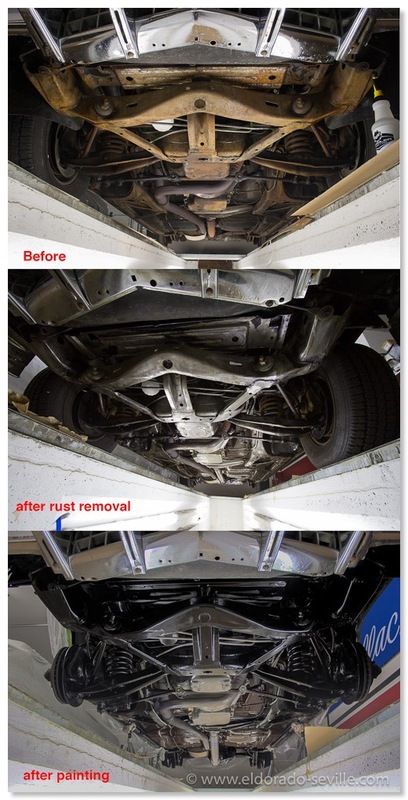 Removed some of the surface rust with rust remover gel. Repainted the brake drums and fully detailed them with original factory markings. 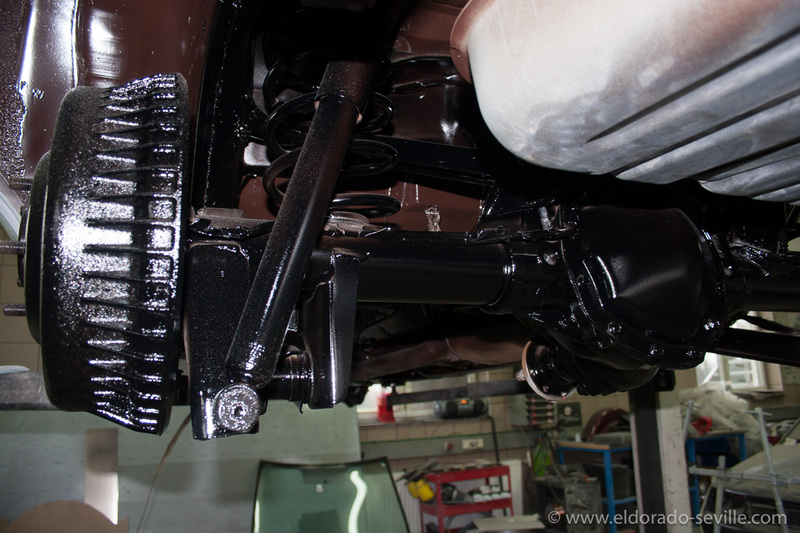 Had the rust free undercarriage painted in a paint shop in original black and brown with epoxy paints. 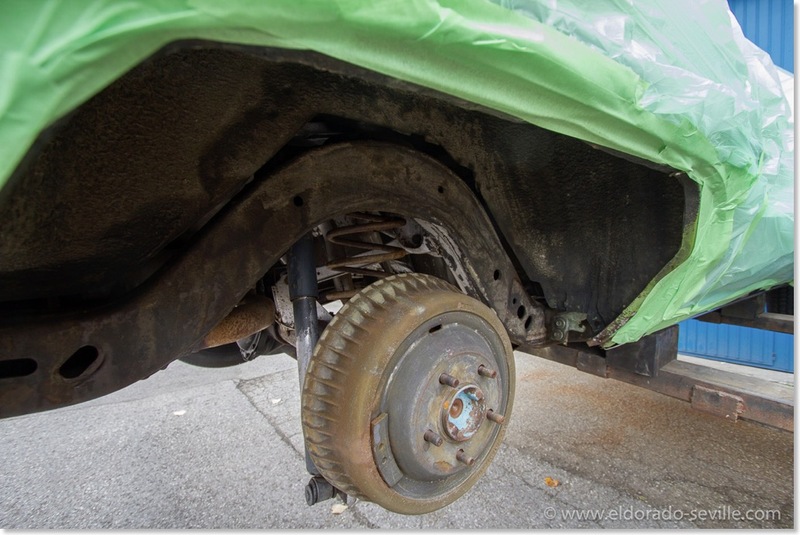 Had another shop remove the paint from the wheel-housings again, as I did not want to do it myself for another time. 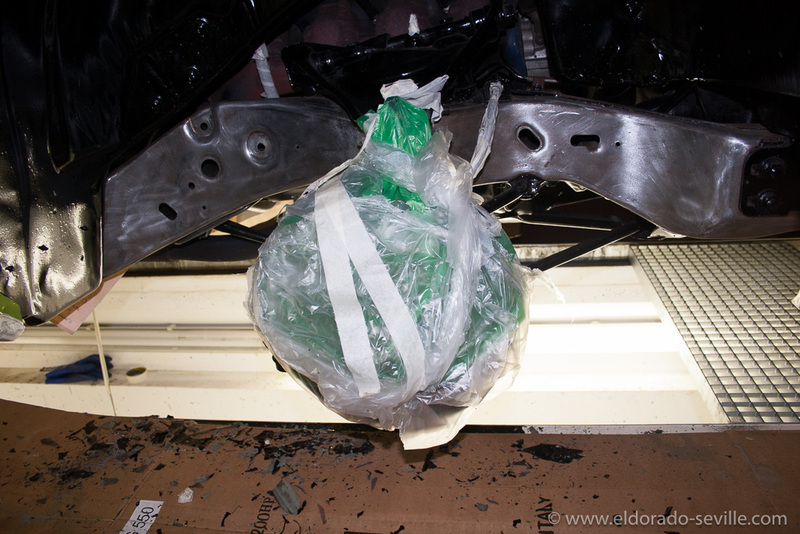 This shop repainted the wheel housings and coated them with transparent undercoating and stone guard once again. I was not satisfied with their work so they had to re-do it. They sandblasted the wheel housings once again to get everything off to bare metal to be able to start all over once again. The restoration shop repainted the wheel housings and coated them with transparent undercoating and stone guard for the third time. I finally was satisfied with their work and took over again to detail all the splash guards and put everything back together. De-rusted the inner sides of the fender skirts and repainted them. Repaired the transmission shift dial indicator which was stuck in “L“ position. Replaced some of the plastic headlight adjusting parts which were broken. Fabricated license plate holders for Austrian plates. 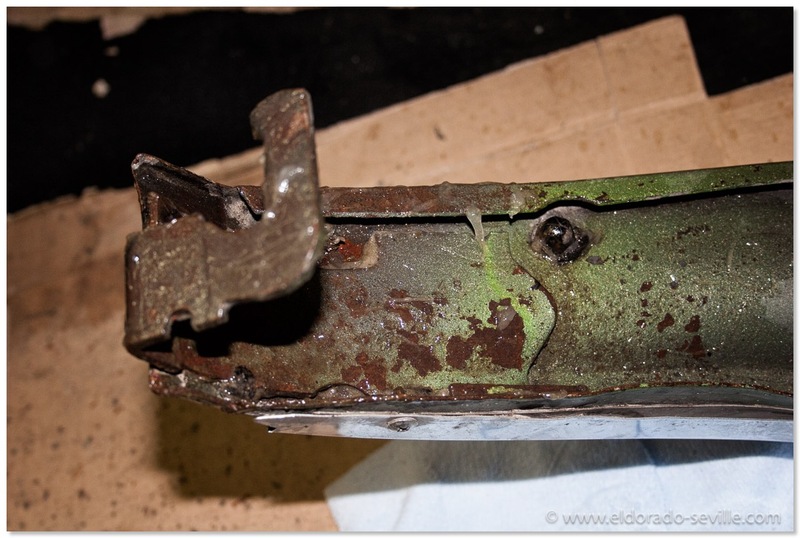 Repaired front ashtray mechanism which was stuck. Fixed loose left outer rear view mirror. Replaced numerous burnt bulbs inside and outside of the car. Replaced AC compressor as bearing and clutch was shot. Replaced front center bumper ends. Adjusted grill which was misaligned by the factory. Adjusted doors as they did not close well. Repaired door striker on passenger side. 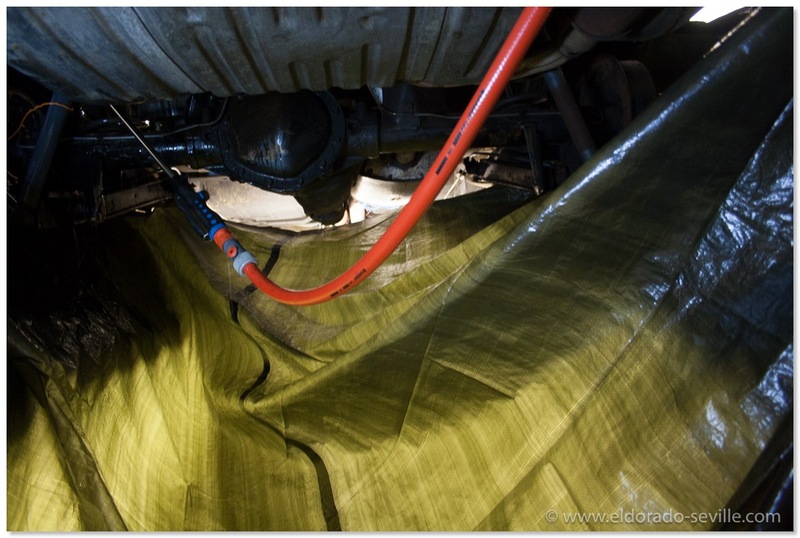 Installed new reproduction - correct heater hoses. Changed shocks front and back. Changed stabilizer link and rubber. Changed lighting system to Austrian standards to get it road legal for the inspection. Sandblasted and repainted valve covers. Fully detailed the paint and interior. Polished the windshield with glass polish. The re-painted wheelhousings. There are a few coats of "Timemax transparent undercoating" and "Timemax Body transparent" - a stone guard applied to protect the paint underneath.This stuff is great and also almost invisible. The re-painted wheelhousings. There are a few coats of "Timemax transparent undercoating" and "Timemax Body transparent" - a stone guard applied to protect the paint underneath.This stuff is great and also almost invisible. You can also see the detailed splash guards back in place. 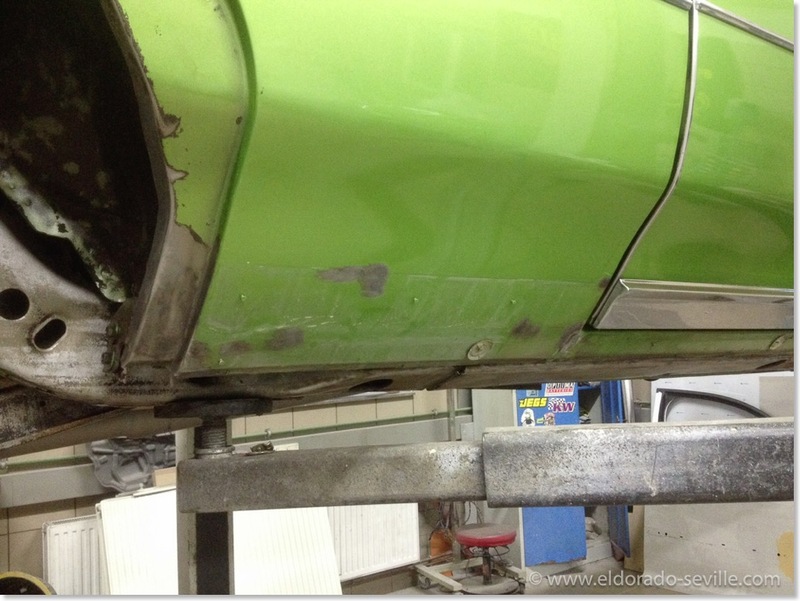 I removed all the rust inside the fender skirts as well and painted them afterwards to protect them. I also undercoated them with transparent undercoating as well. 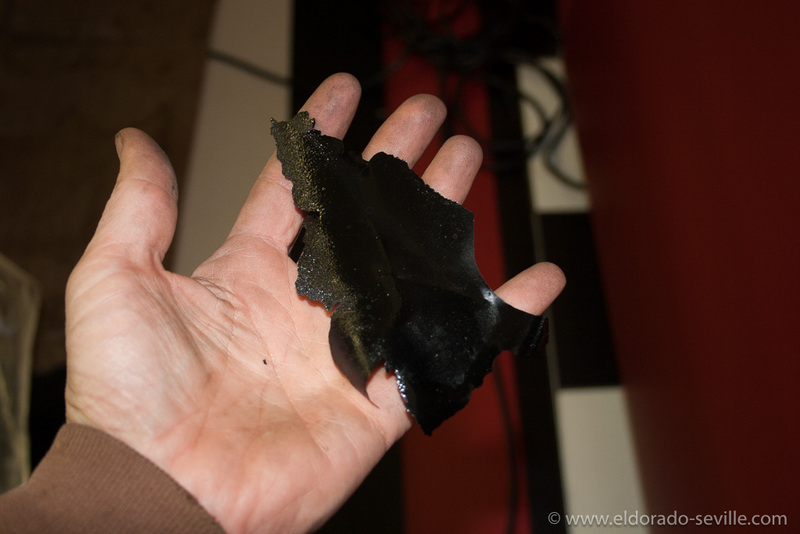 I used tar remover to clean the inside of the fender skirts which still had some factory applied undercoating on them. 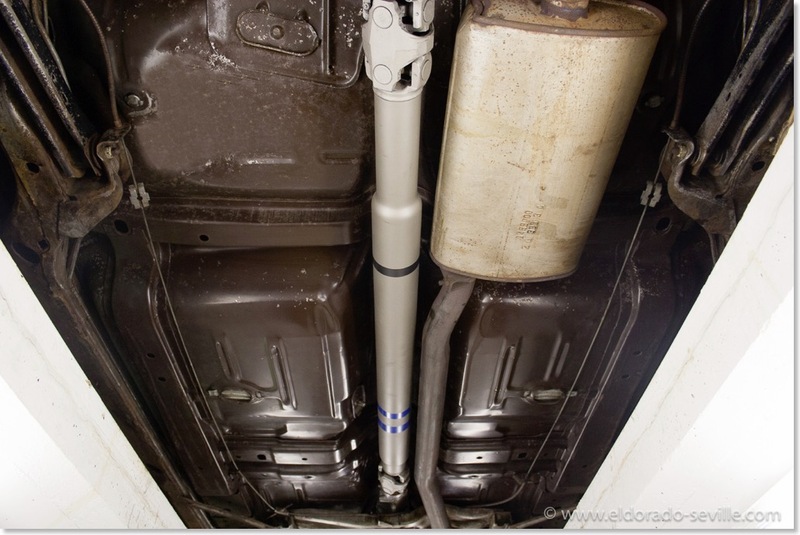 This is how the rest of the underside of my 74 is looking now. I painted everything in the correct colors and protected it with transparent undercoating afterwards. 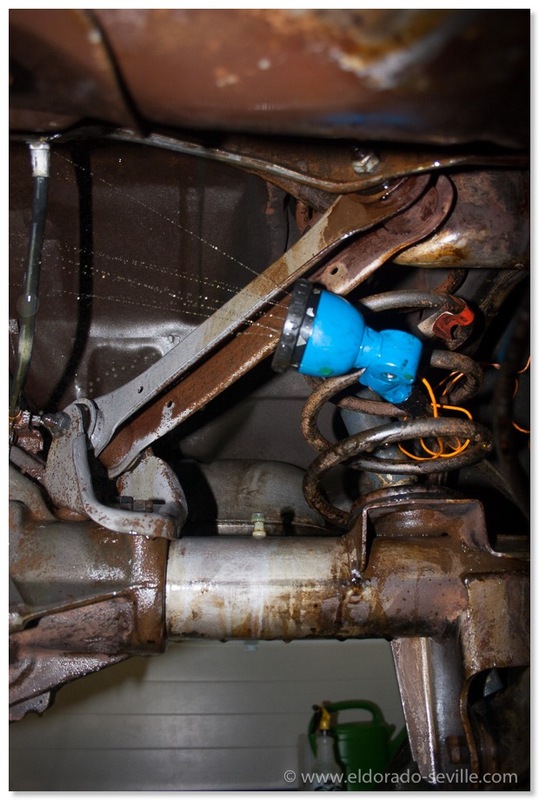 I do not know why I have such bad luck with my 1974 undercarriage project. I already had to do it twice and I just found out that I will probably have to do at least the inner fenders a third time... On Thursday, as a final step, I added a transparent stone chip guard to the wheel housings and it somehow reacted with the paint underneath and caused ripples. The manufacturer insists that this is impossible and has no clue what could have caused this, and I had to send them some samples for further investigations. Normally I never give up, but all I know is that I do not have the power, time, money and motivation to do it a third time all by myself. I have no idea how to finish this project now, I will most probably have the 4 wheel housings done again by a professional restoration shop eventually. The rest of the undercarriage is finished and looks fantastic. I used the correct colors and replicated the factory new look. The finished undercarriage - I applied some transparent undercoating over the freshly painted underbody which is completely invisible. This is some great stuff! 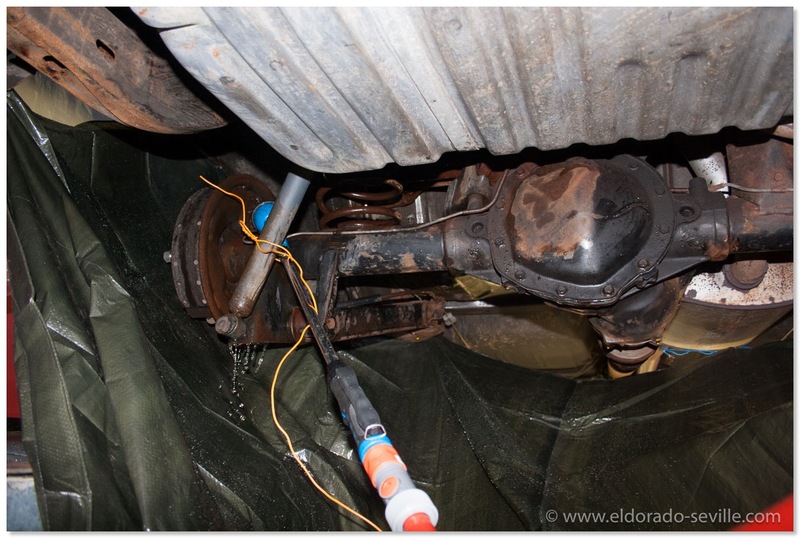 The work on the undercarriage continues now after the problems I had last fall. As the new paint did not stick to the undercarriage at all, I have to redo the entire project I started in the fall of 2015 once again. The car already looked fantastic when I found out that I have a problem. The paint shop wanted to have the undercarriage media blasted this time, to make sure that everything is 100% clean, and that the paint can stick to the metal much better due to a rough surface. 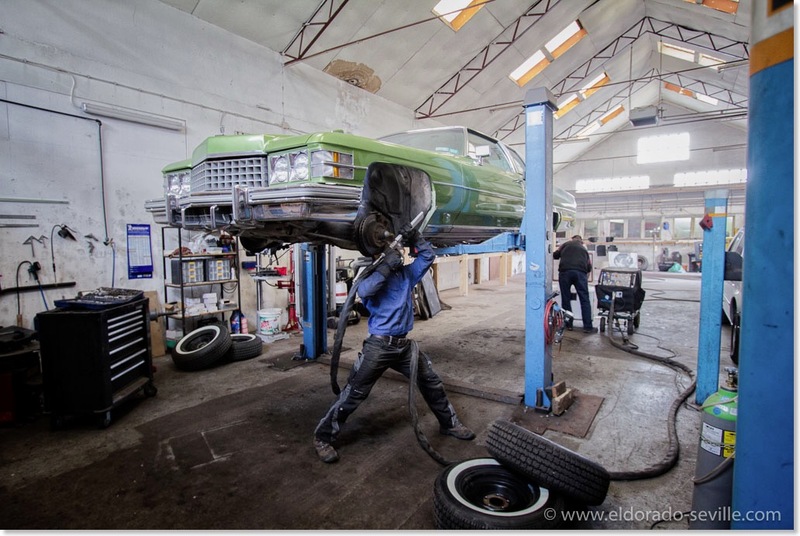 Personally I´m not a big fan of media blasting a non disassembled car, as so many things could go wrong and I do not recommend to do it to anybody else. 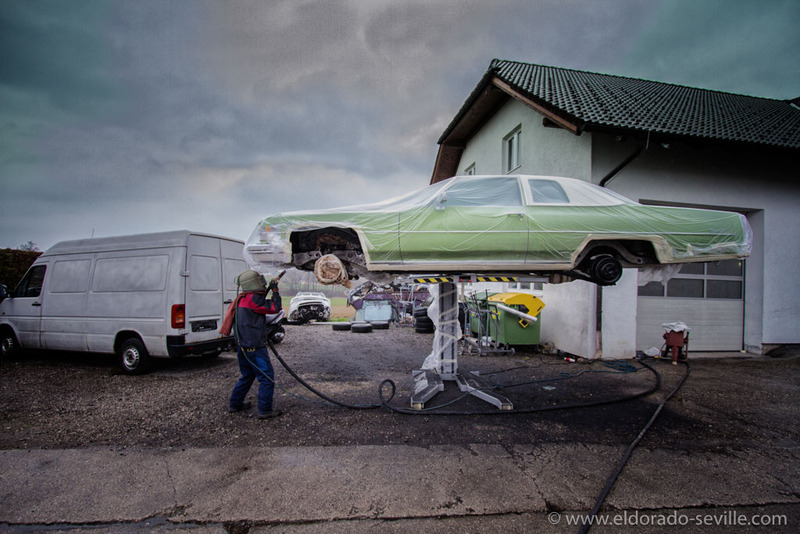 The paint shop really wanted to go this route though, and they said that they have a very experienced media blaster to perform the work. They did tape the car for hours to make sure that the blasting media would not go close to any mechanical or fragile parts. The blaster worked with very low pressure (1bar - 14psi) to get the old paint off and it really came off within minutes. He did not want to risk anything and so there were some areas with the old paint left after he was finished. We then spent a whole day trying to get rid of the rest of the remaining paint, by hand. With 240 grit paper we worked on all the areas we could reach. 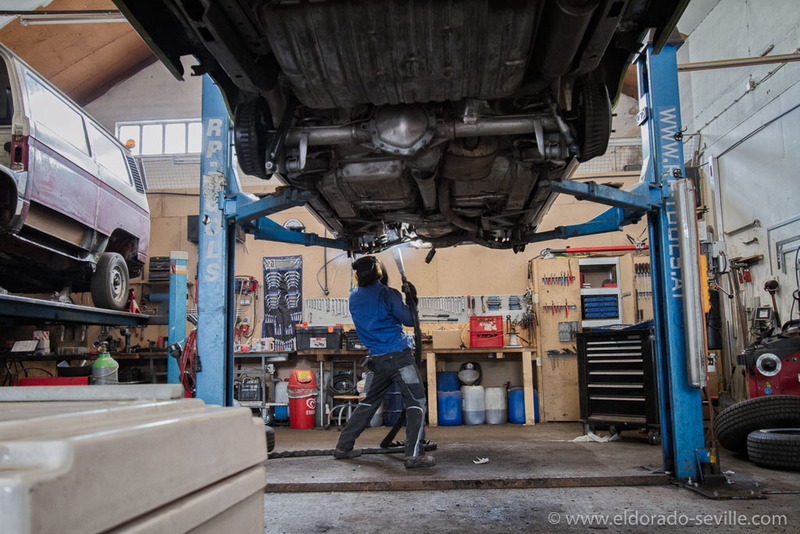 After a whole day under the car it was clear that we could not reach all the areas and that the job would not be good enough. I then contacted a dry ice blaster who took over to remove the rest of the remaining paint. Normally you cannot remove paint with dry ice blasting, but as the paint on my car´s undercarriage does not stick, it works. It took him a couple of hours to get everything off. 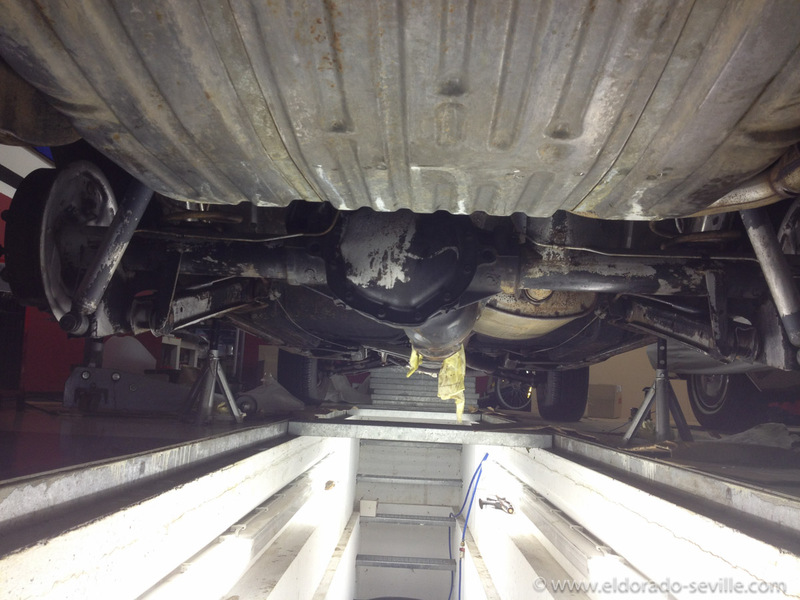 The undercarriage is now completely clean and back to bare metal once again. 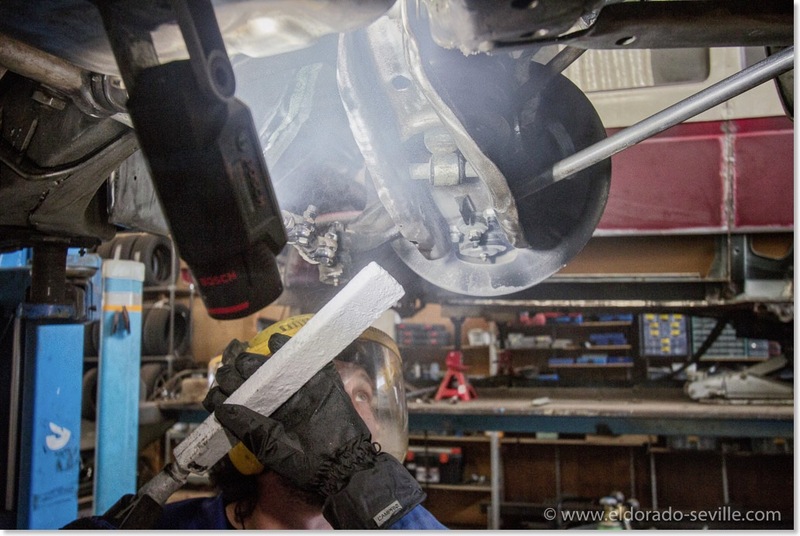 He even was able to remove some of the old undercoating in the rear wheel wells which the other dry ice blaster could not get off. We will now degrease everything multiple times and then scuff all the metal. Then its time to mask all the necessary parts and repaint everything once again with 2k paint. I will keep you updated here on my website about the progress. 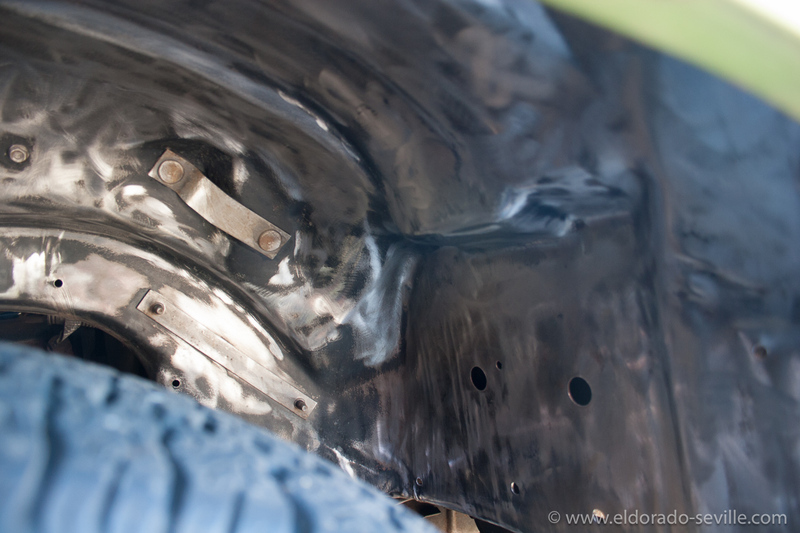 The bare metal wheel housing after blasting. The rest of the paint was removed later by hand and by dry ice cleaning. Ready for dry ice cleaning. 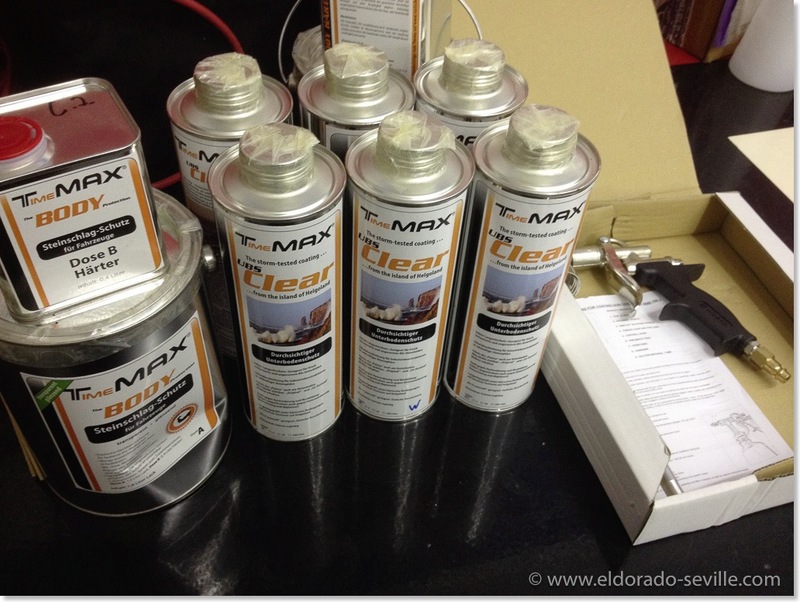 The dry ice cleaner managed to get the last undercoating out of the rear wheel housings. Everything is perfectly clean now. All the suspension parts were perfectly cleaned as well. 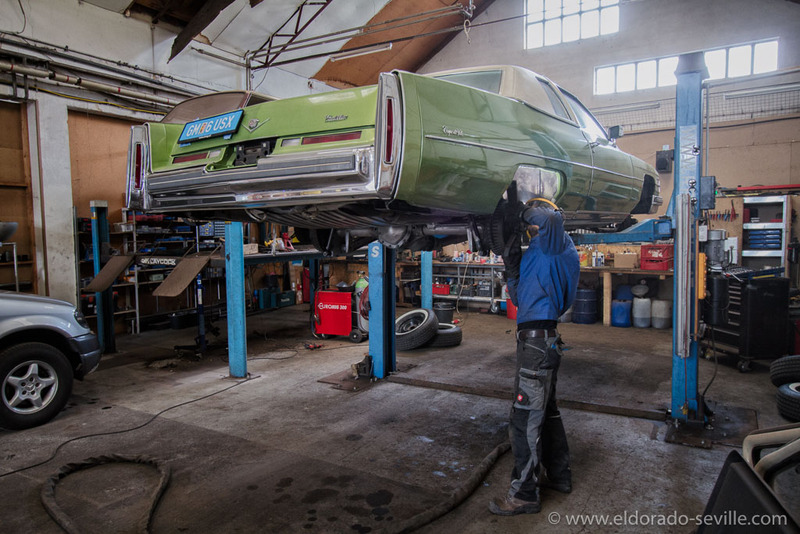 For the last three months I have been working numerous hours to clean up the undercarriage of my low mileage, all original 1974 Coupe deVille. As you can see here on my website and in this image gallery. As I had put so much effort in totally de-rusting the underbody of this low mileage car, I decided to let a professional body shop re-paint the bare metal frame, suspension parts and floor pans this time. 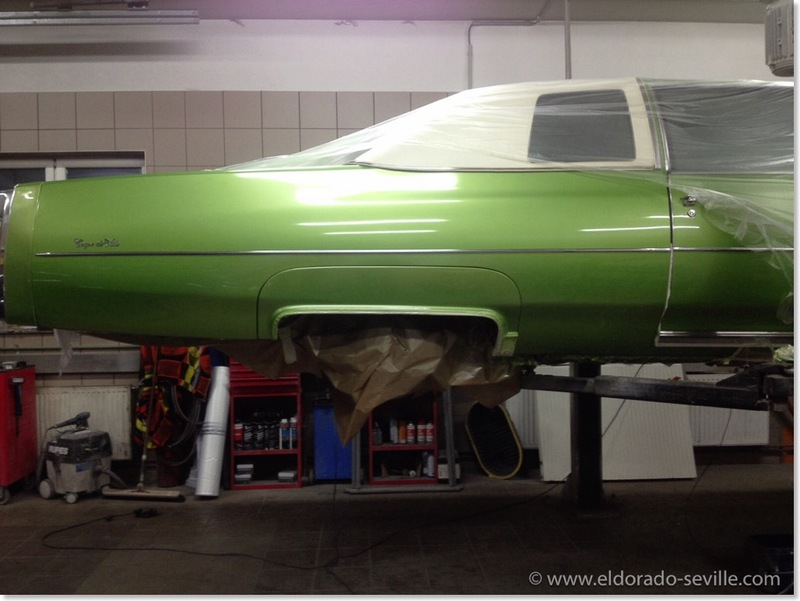 My goal was to have the ultimate quality paint job in the factory correct colors underneath the car. I´m not very good in painting and my attempts often result in runnings, which I have to sand out and other imperfections I wanted to avoid. So I handed the de-rusted car over to the paint shop. When I got the car back, everything looked o.k. as you can see on the pictures below. I was not too impressed by the work they did, as there were quite a few imperfections and some sloppy paint work visible, if you looked very closely. At this point I was already worried that they maybe did some shortcuts before painting, when they should have properly cleaned the bare metal, before they sprayed the primer. They used some high quality epoxy primer and 2k paint for the job though. There was a terrible mishap at the shop, as they did not mask off the engine bay properly, so all the paint dust and overspray collected inside of the engine bay, and the entire engine bay looked like somebody emptied a spray can into the engine compartment from about 5 feet away. Everything was covered with paint overspray. I had no idea how I could remove the overspray without damaging the original finish of the engine, rubber hoses, cables, wires, accessories and engine parts. This was a terrible situation for me. 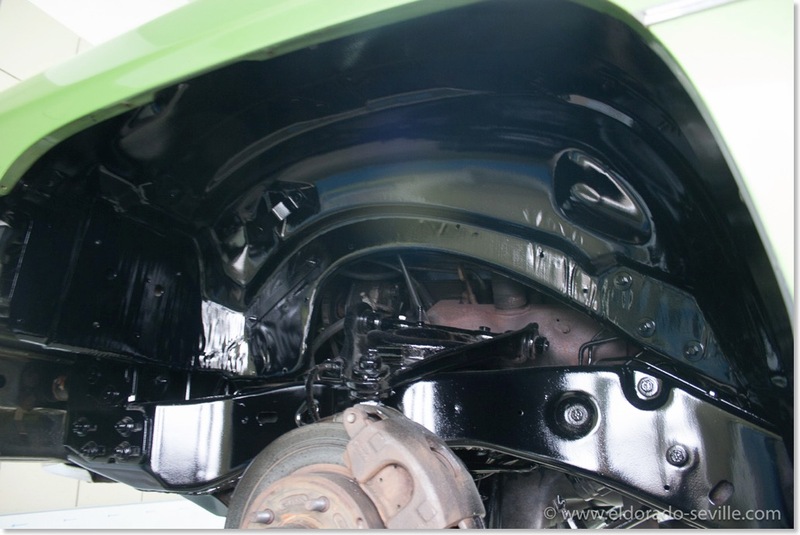 My plan is to protect the undercarriage with a transparent undercoating, which is as good as invisible if properly applied. It will provide a perfect protective shield against road debris, stones and is rust prohibitive. 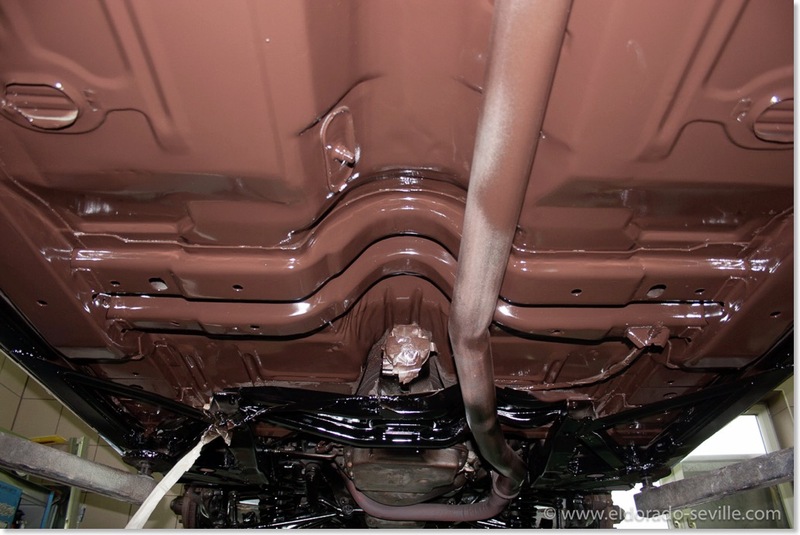 This high-tech material is far superior than the original tar based undercoating which is normally used, and as an additional bonus you can always see what is going on underneath the undercoating. I decided to use a product from a german company called "Timemax USB Clear". 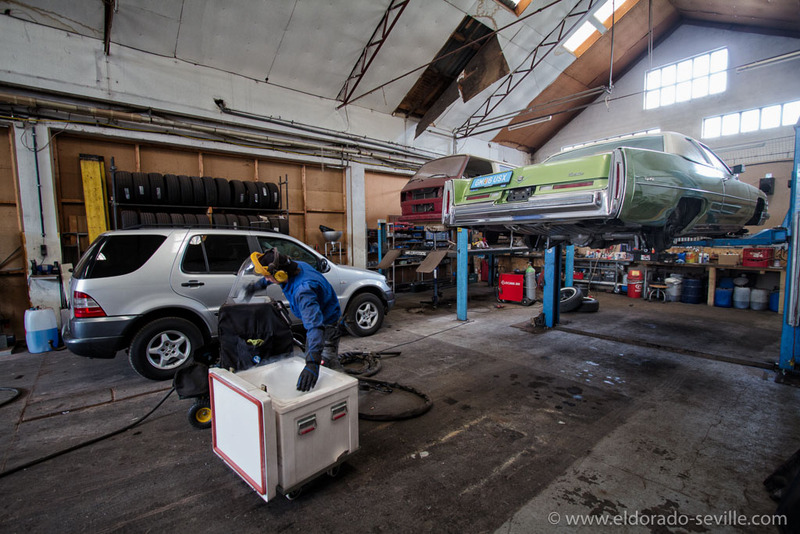 Timemax is one of the leading specialists for rust protection, and their products have won some independent tests, done by classic car magazines. THE PAINT DOES NOT STICK! 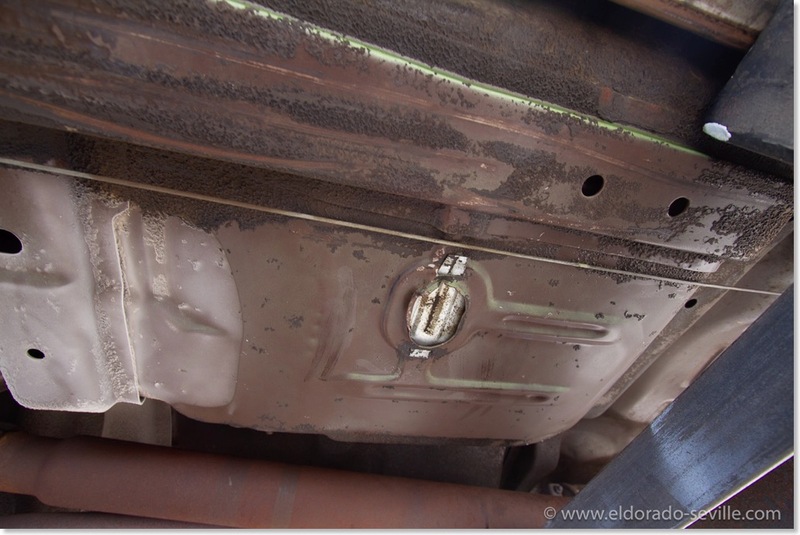 Of course this was another big shock for me, as this meant that 3 months of work were completely destroyed… When I inspected the areas underneath the removed paint, it quickly became clear that the paint shop did not treat and clean the bare metal before painting, as they should have done. They just did a quick wipe with silicone remover. 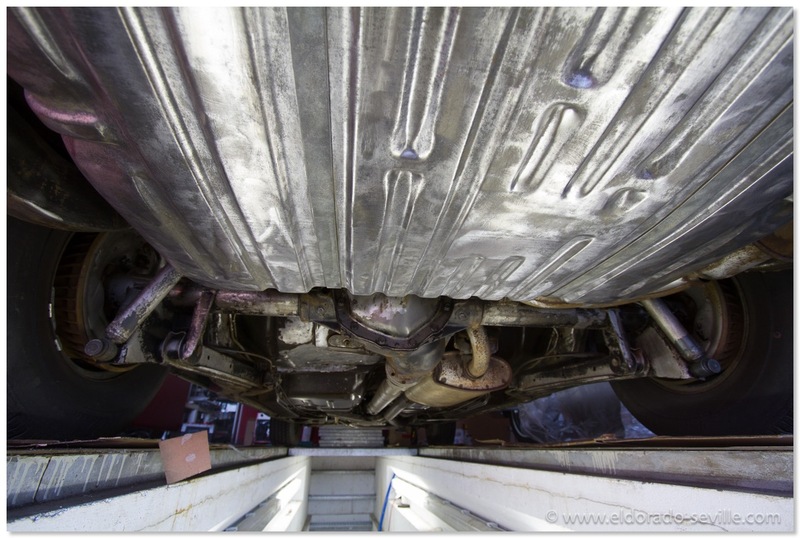 Of course the bare metal underneath a 41 year old car is full of oil and grease and needs a lot of cleaning with strong chemicals before paint will adhere to it. Unfortunately they skipped this most important step. 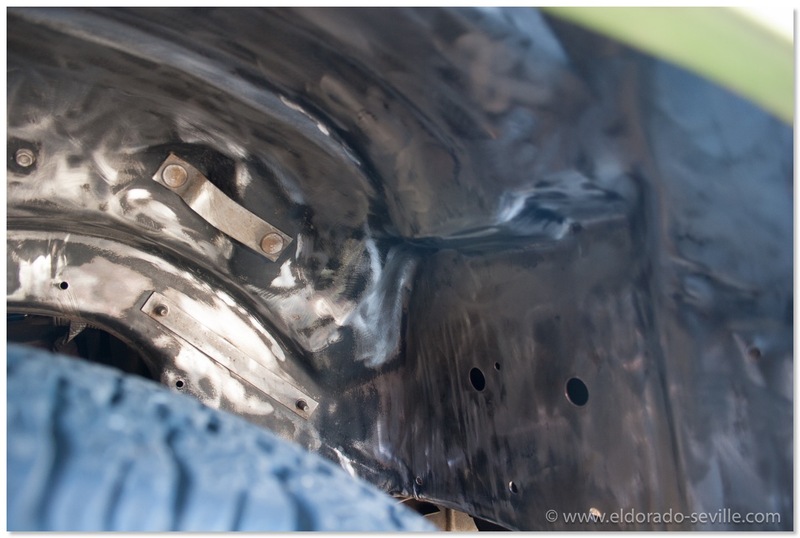 Although I brushed away all the rust and everything looked shiny, the oil and grease is in all the pores of the metal. This now means that ALL the paint they sprayed on has to come off once again. 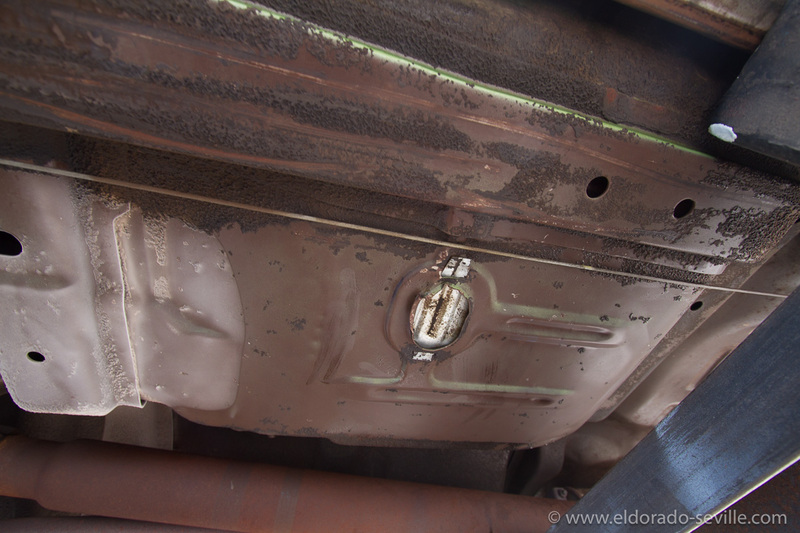 Also the brown paint on the floor pans has to be stripped again as well. I asked a dry ice cleaner to try if it can be removed with his method, and it soon became clear that it is possible, but will take at least one full working day, and this will cost a small fortune. There will probably be some areas left which I will have to rework by hand. The paint shop knows that they did a lousy job and is very supportive to resolve this issue. Before dry ice blasting the undercarriage once again, we will try to get the paint off with a powerful high pressure washer. 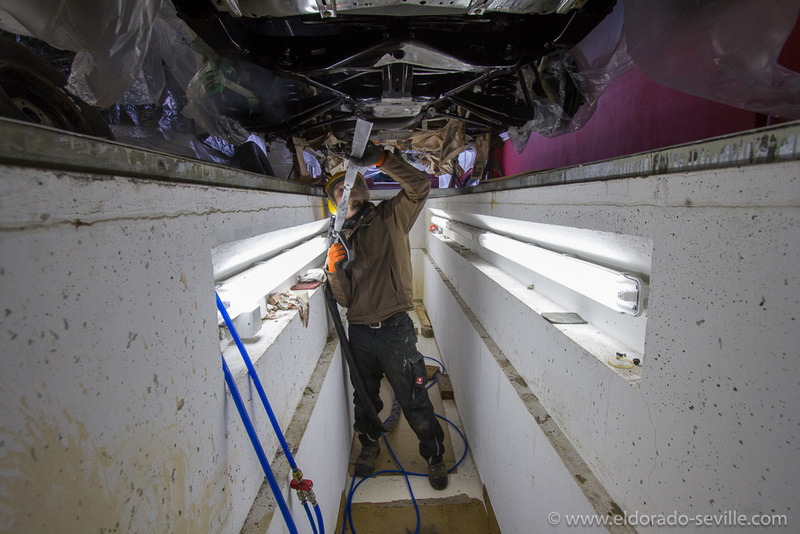 Once the paint is gone again, we will clean the bare metal multiple times with acetone, marine clean, a special metal cleaner and metal prep. We will also sand everything with some coarse sandpaper to get a little rougher surface to make sure that the paint adheres much better next time. I also want to go for a black with less gloss, as it was too glossy and did not look correct. I hope that the weather will be good enough in January 2016, so that I can start all over again. At the moment I do not have the motivation to do anything on the car, and I do not even want to look at it, as it hurts too much. I still have to recover from the things that have happened. This is so frustrating. I hope that it will look like it should after the second attempt. The 3 stages of the project so far. Everything looked o.k. 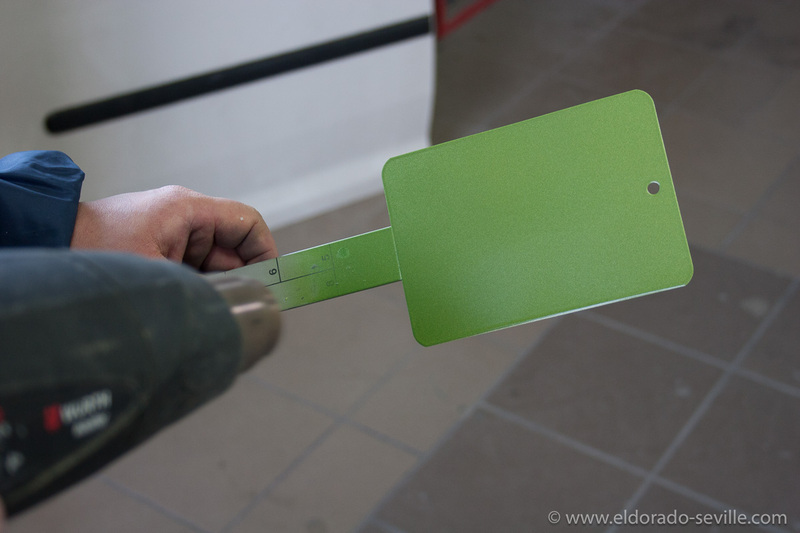 after painting, but the paint does not stick to the metal due to poor cleaning by the paint shop. So ALL the new paint has to come off again. 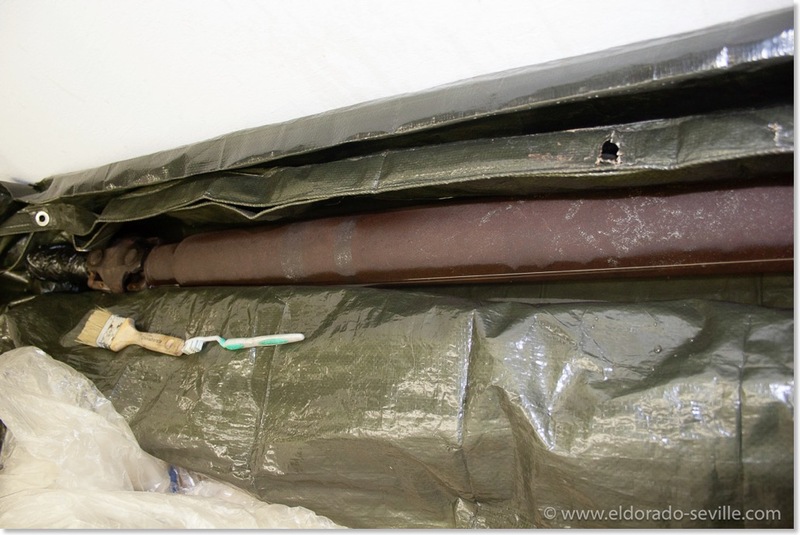 Here the dry ice blaster is trying if it can be removed with dry ice cleaning. Due to all the problems I had, I completely forgot about some fasteners from the rubber splash guards, which I had soaked in the rust remover solution for more than a week. 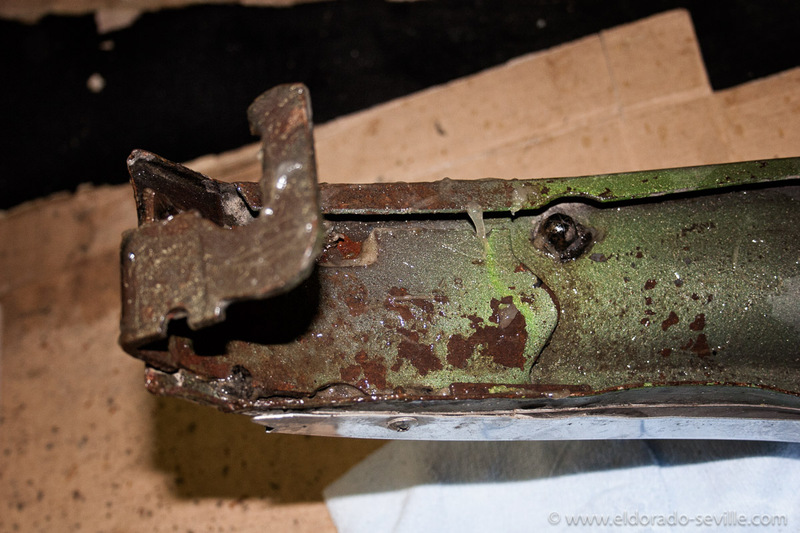 This long time in the liquid removed all the surface rust, but the acid also ate away the zinc plating. 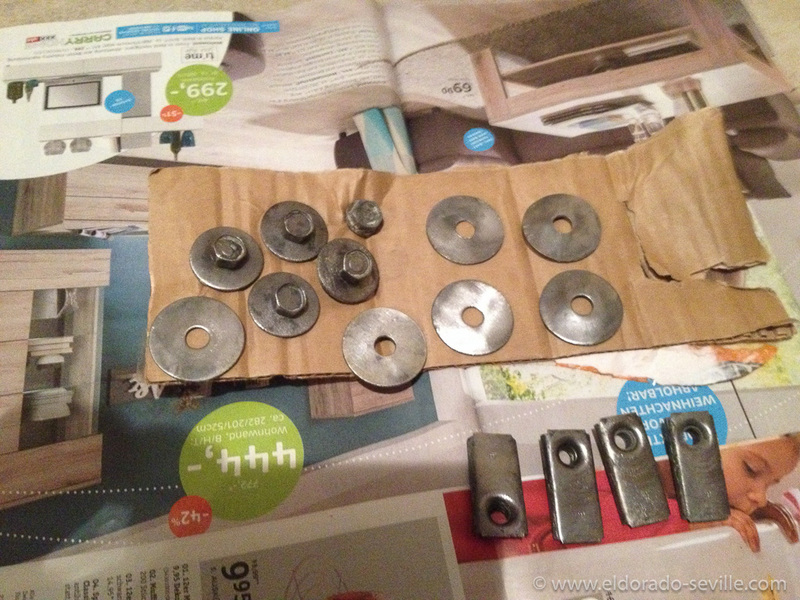 So whenever you try to remove the rust from anodized fasteners and screws, make sure not to soak them for too long. 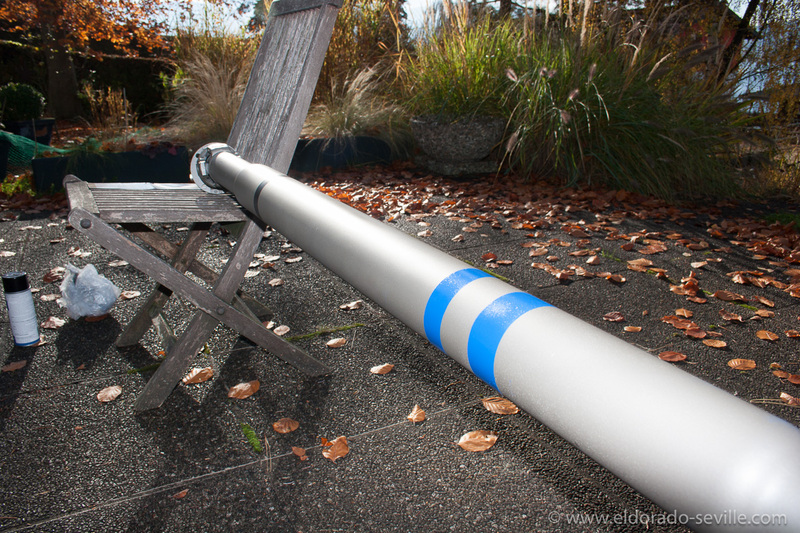 As I can´t get the fasteners and screws very easily here in Austria, I had to brush away the remnants of the zinc coating with a wire brush, and then painted everything with Eastwoods Silver Cad paint. This does not look 100% correct of course, but will have to do until I find some original replacement hardware. 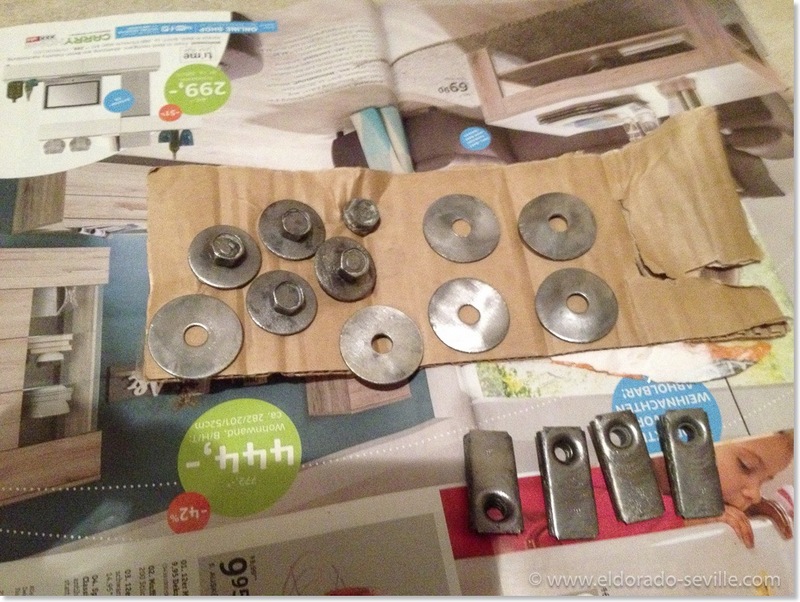 Besides a few washers, these fasteners won´t be visible anyway. I forgot some of the fasteners for the rubber splash guards in the rust dissolver solution. It ate away the zinc plating. So I had to remove the remains of the zinc plating with a wire brush. 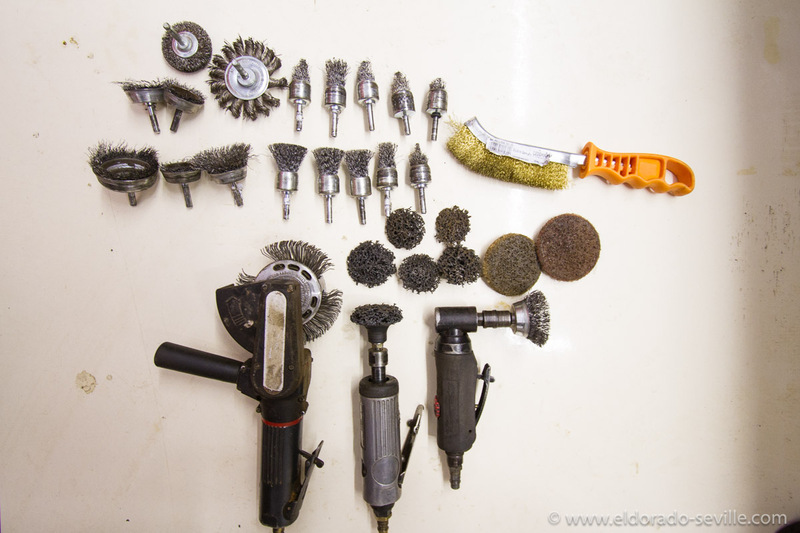 The cleaned fasteners. I spray painted them afterwards with Eastwood zinc paint. 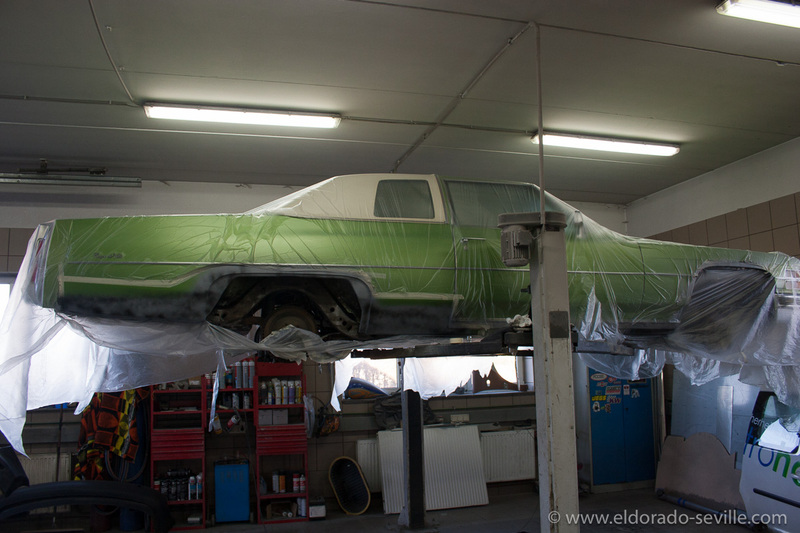 I´m restoring the undercarriage of my 1974 Coupe deVille at the moment. 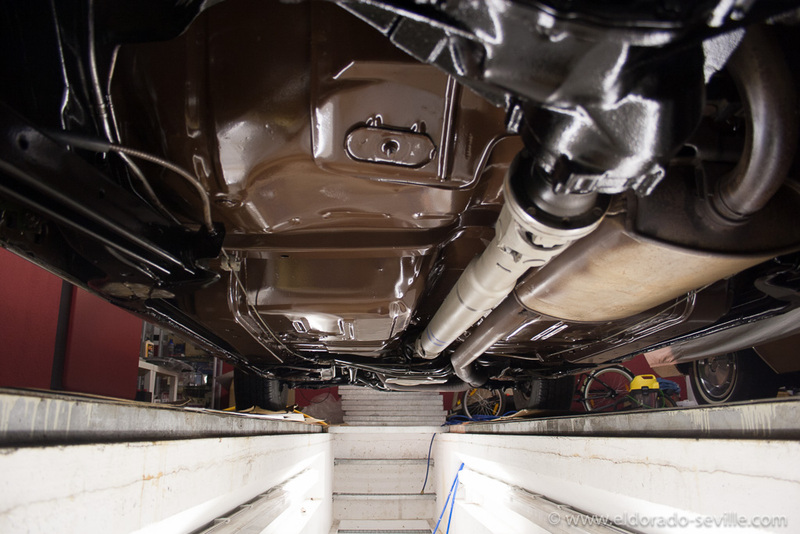 Now that I had removed ALL the rust over the last few weeks the underbody needed a fresh coat of paint. After dry ice cleaning some light surface rust also showed up under the rear quarter panel ends, the fender skirt area and the lower front fender. All these areas were attacked by water, road debris and other stuff coming from the wheels. These areas suffer the most. 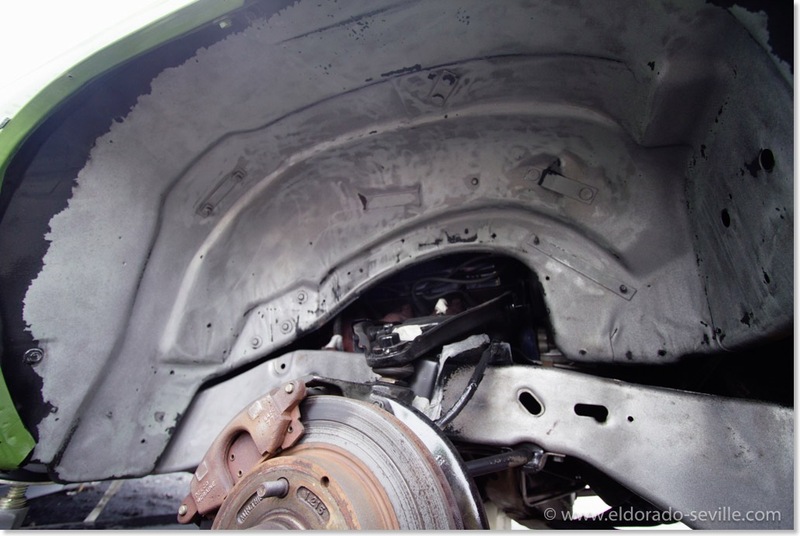 Also moisture got trapped underneath the body moldings in this area. 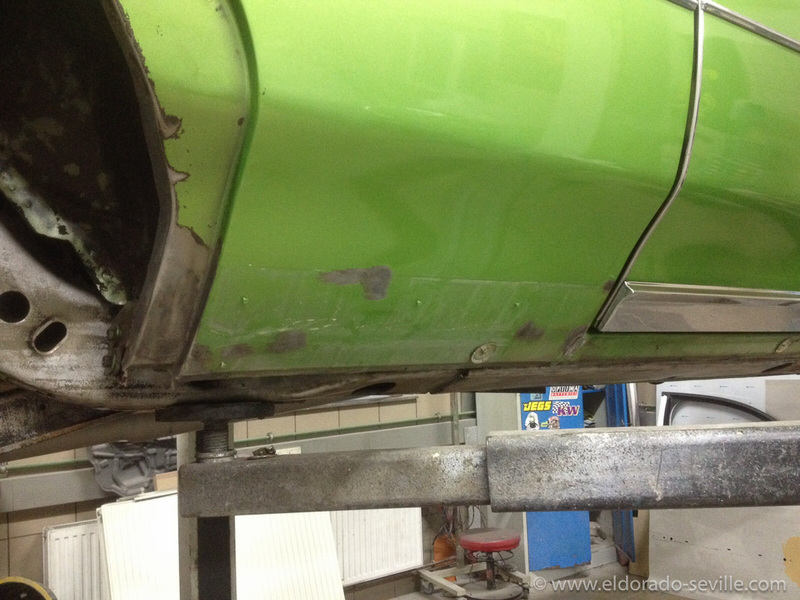 When we removed the moldings fortunately nothing really serious showed up, but only some small spots needed a little attention, more as a preventive and cosmetic measure to make sure that rust can´t spread underneath and show up when its too late to fix it. 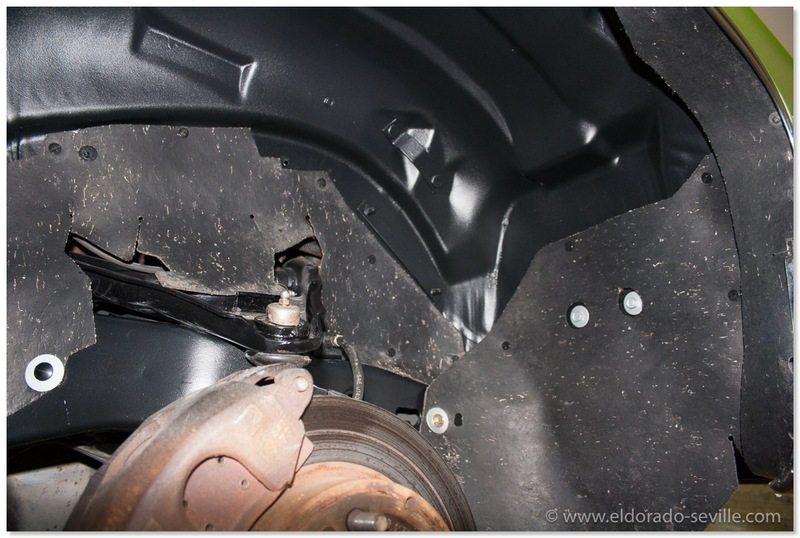 The downside of this repair is that I had to sacrifice a small percentage (maybe 5%) of the original paint on the rear quarter panel up to the belt line molding. I do not like this fact very much, as I prefer original paint over repaints, but the other option would only have been to wait for rust damage to happen eventually, but therefore have 100% original paint on the car… As I intend to drive the car I wanted to have everything fixed as good as possible. 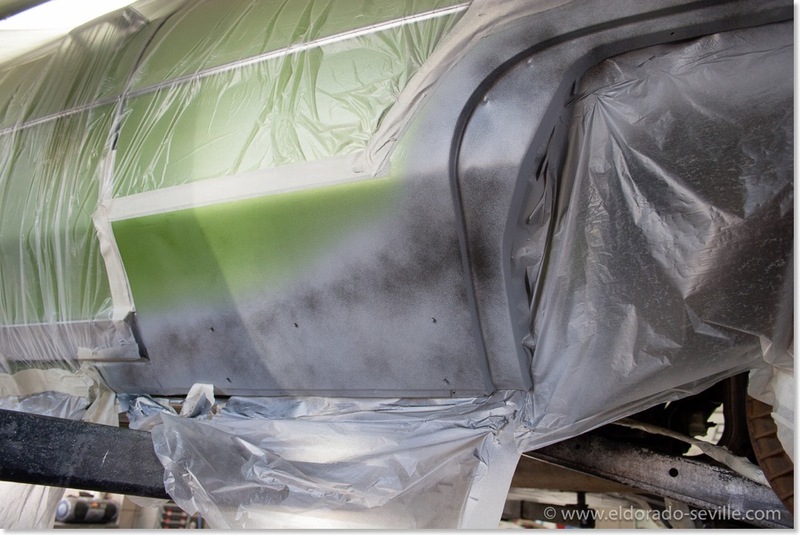 A friend of mine is a professional body man, and I asked him to take over from me and do the painting and body work, as I do not have the expertise and skills to do this myself. 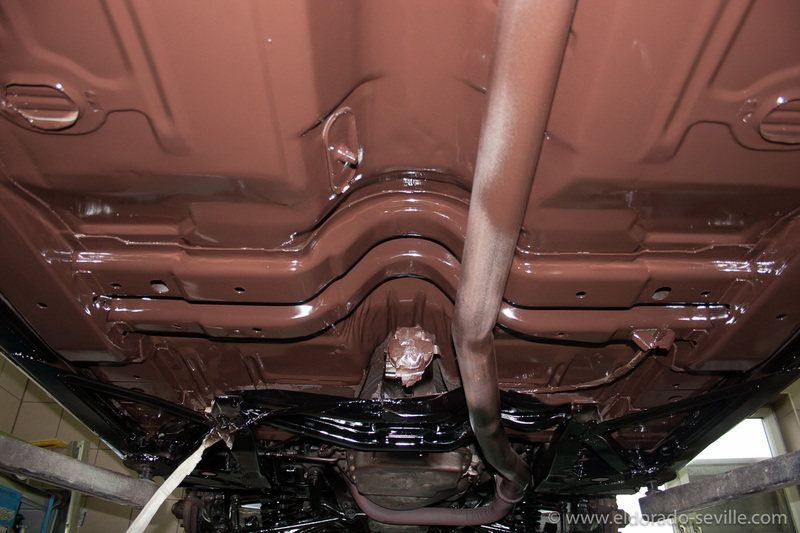 The floor pans are now repainted in the correct shade of satin brown, which he had to custom mix, based on "Chocolate Brown" which is a little too bright and contains too much red. 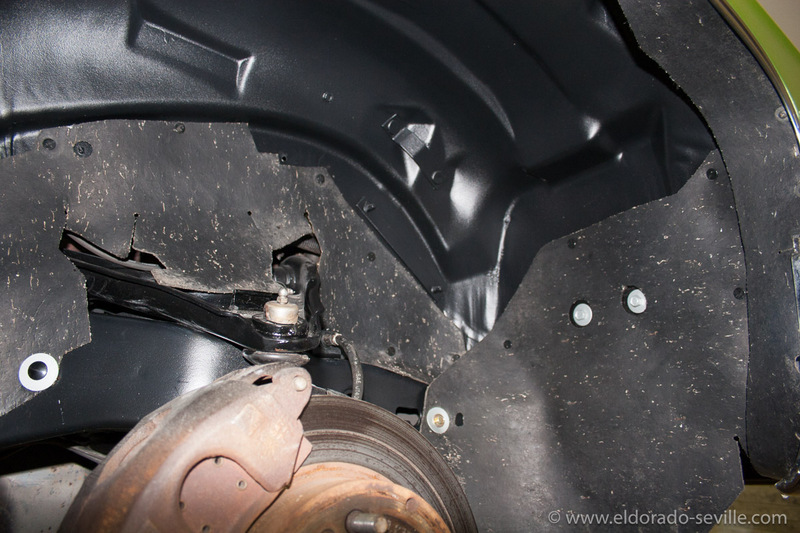 Then the floor had to get taped off again to paint the frame and suspension parts in satin black. 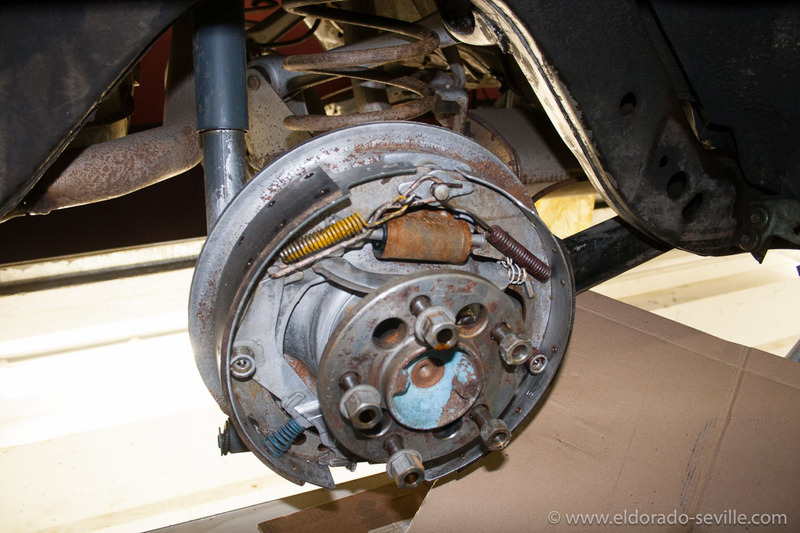 Once the car will be back home, I will re-paint the brake parts in a bare metal look and rebuild the brakes while everything is apart. I also already have new shocks waiting for installation, I will put in new brake hoses, repair the radio and heater core and do a good general tune up and change all fluids. So next spring I should have a car which looks and drives like new :-) You can find all the pictures of this project in a gallery here. 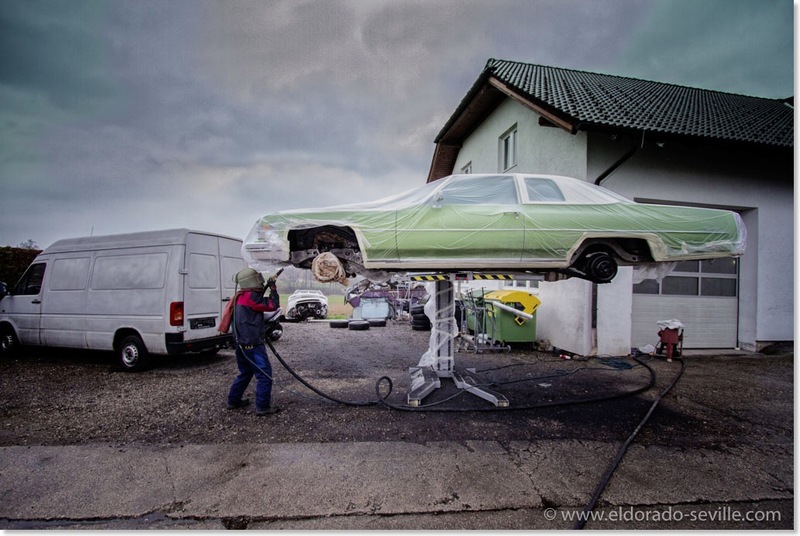 The Cadillac in the paint shop. This are the areas on the sheet metal that needed some attention. Nothing serious - but better to fix it now before a problem arises eventually in the future. 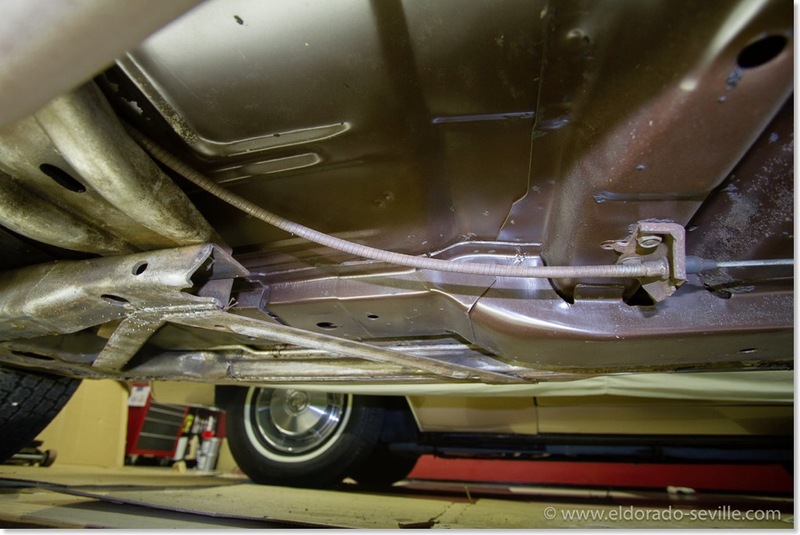 Here the lower trim is removed to see what is going on. 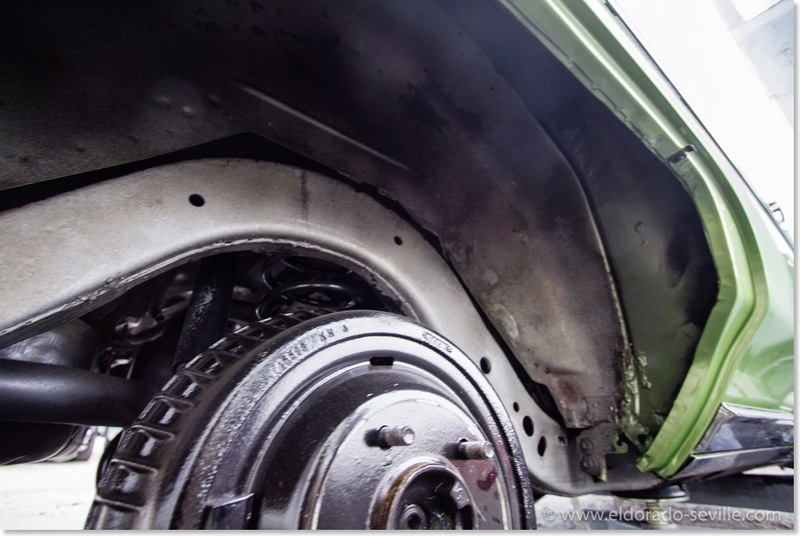 The lower edge behind the rear wheels had suffered a bit over the last 41 years... I decided to have it fixed properly and sacrifice a little of the original paint for this. 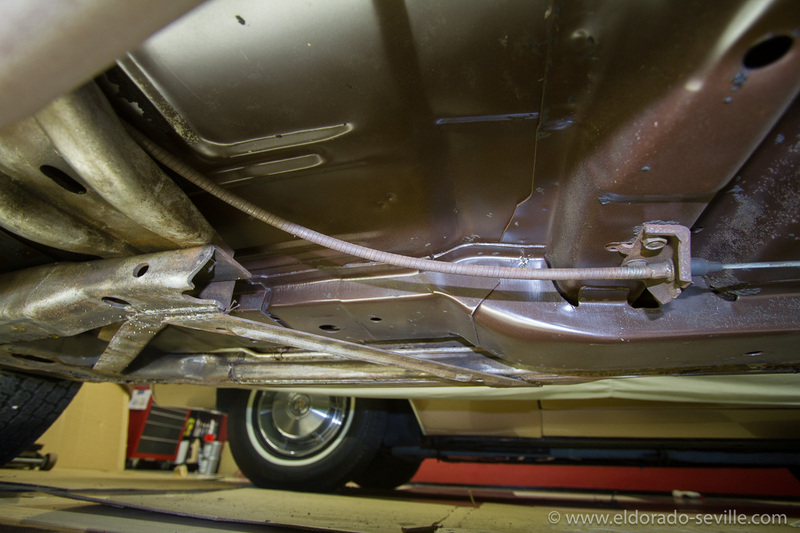 Also the area around the fender skirts needed a little attention to look like new again. 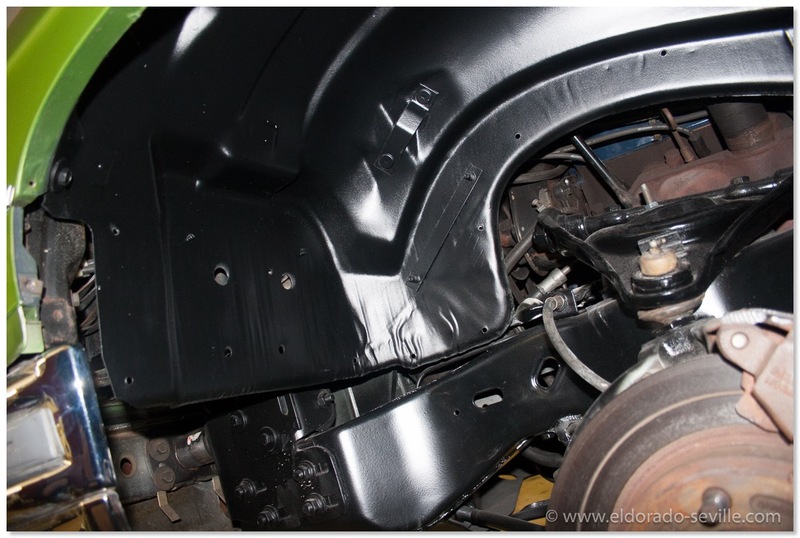 No real severe rust issue, but more of a preventive and cosmetic measure... Fender skirts will be repainted as well... On this picture you can see the primer and a very small amount of filler for a perfect surface. 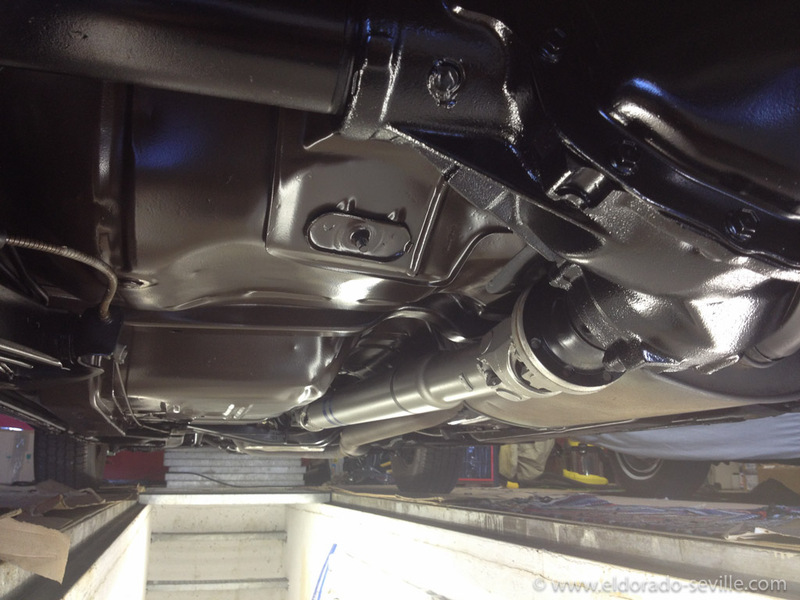 The floor pans are now repainted in the correct shade of brown. 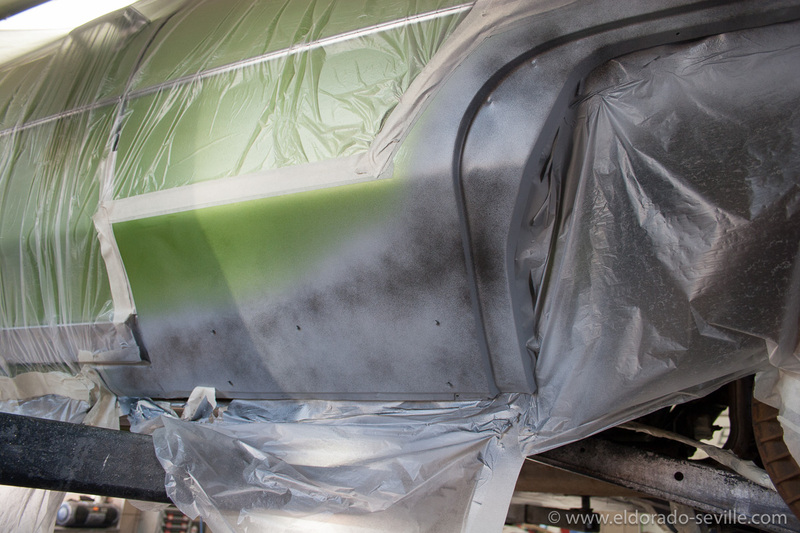 It will get a little less glossy once the 3 coats of transparent undercoating are applied. 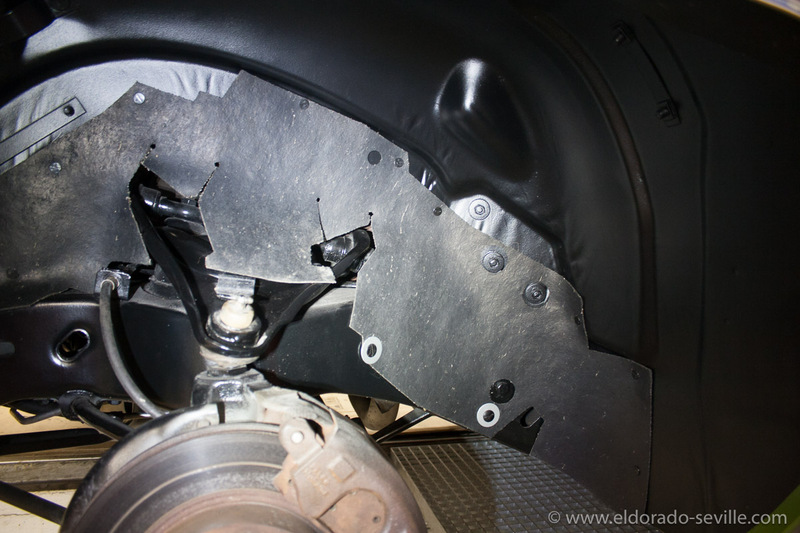 The wheel housing after the first coat of satin black. 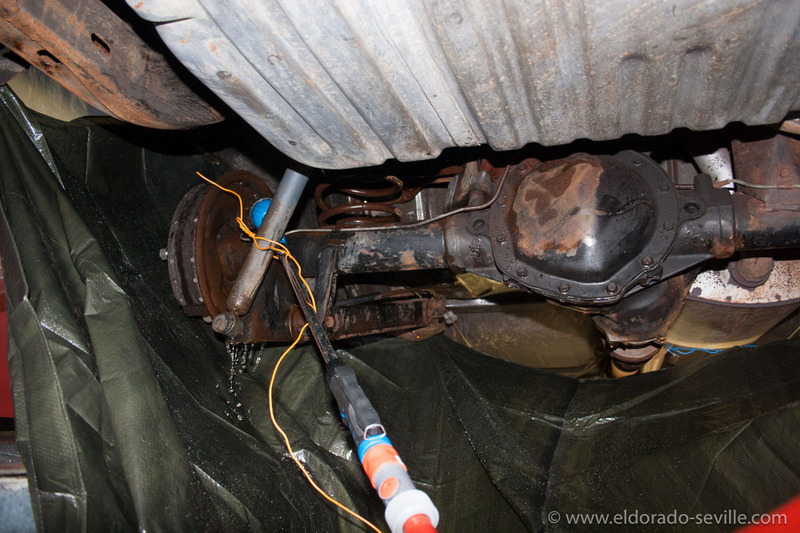 The rear axle is back in black. 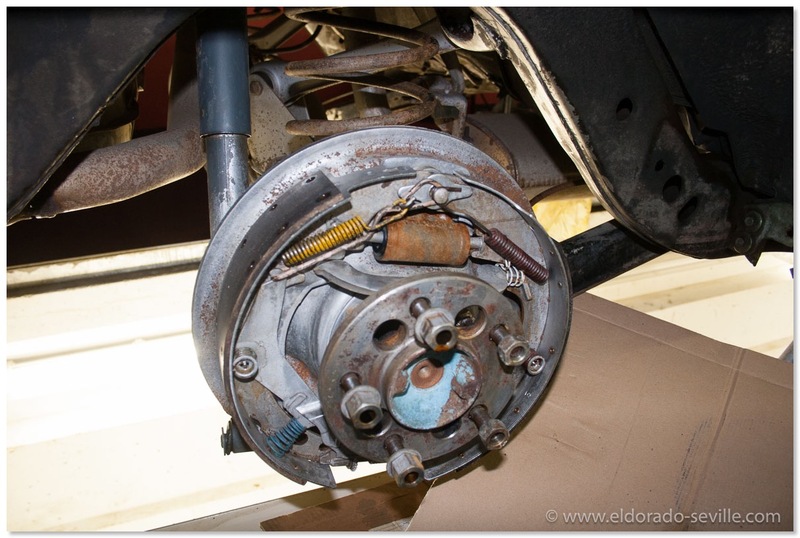 I will paint the rear brake drums in a bare metal look later once the car is back home. I will also install new shocks and paint the tank with Eastwood Tank Tone paint. Finding the right shade of Persian Lime for a perfect match. The computer had the color in the system and it already was a very good match. The paint shop found a perfect match for the Persian Lime paint. Great job Jürgen! You can find all the pictures of this project in a gallery here. 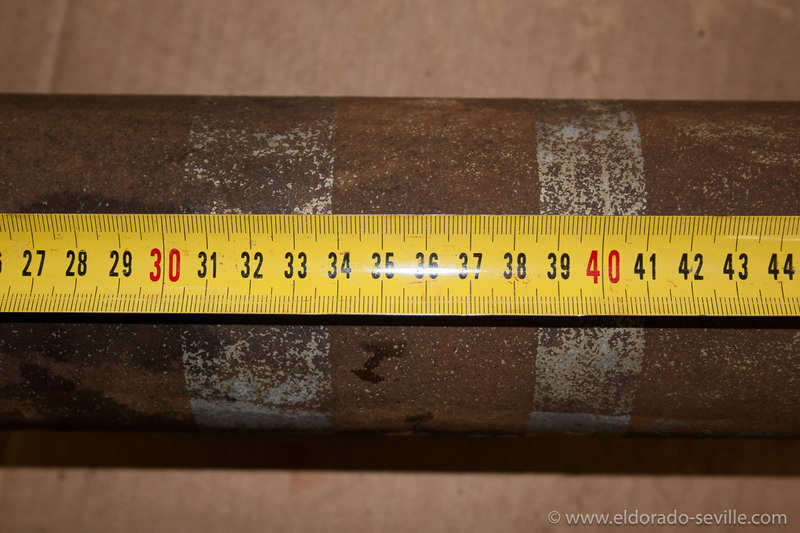 While I am in the process of restoring the complete undercarriage of my 74 Coupe deVille for cosmetically reasons - I also had to decide what to do with the rusty driveshaft. 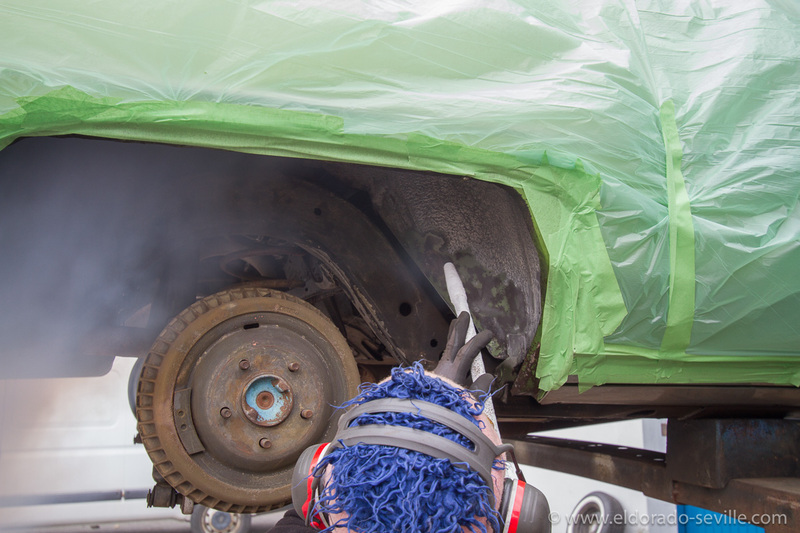 My initial plan was to use a wire brush to knock of the rust and just paint it black like most people would do. But I then decided that I wanted to go the extra mile, do it properly and put it back into the condition it was when it was built. 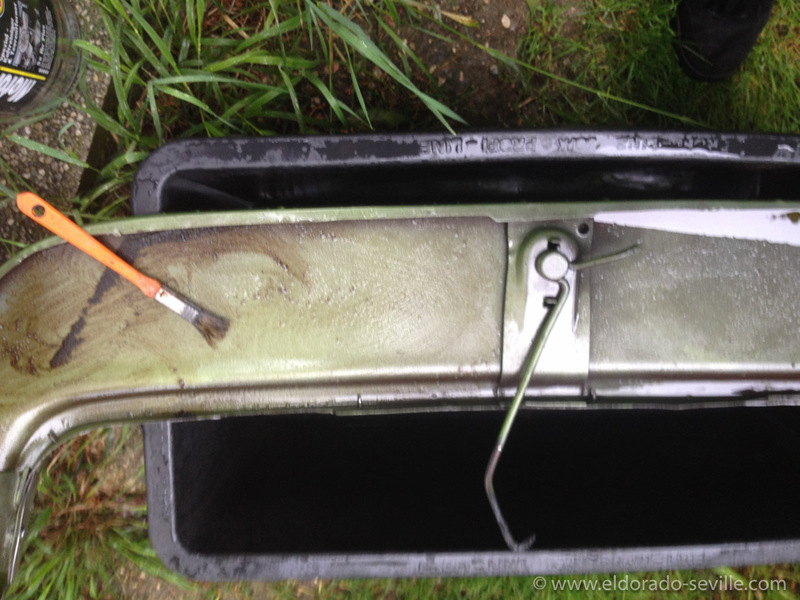 I wanted to remove the rust chemically in a rust dissolving fluid that is normally used for de-rusting fuel tanks, but I had no idea how I could soak such a long piece in this fluid. 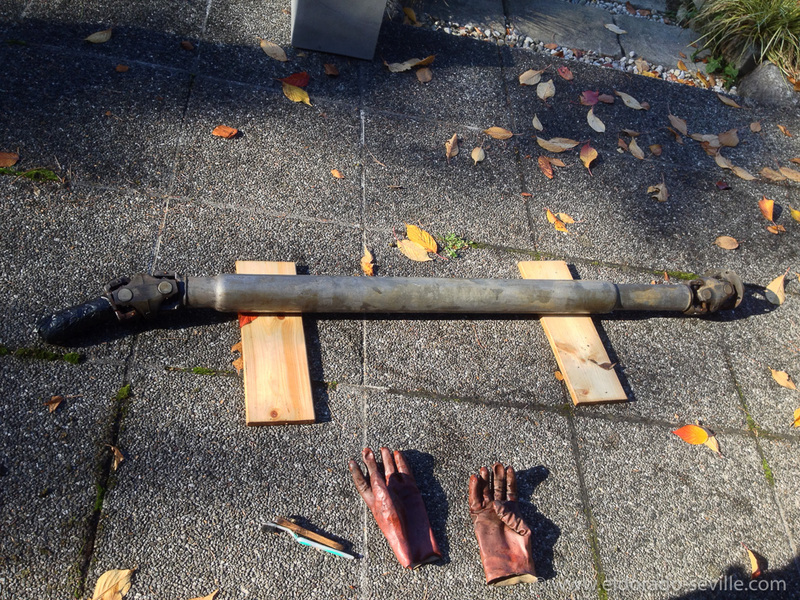 I came up with the idea to just use a big tarp and put some wood to the sides, put the driveshaft in it and fill it with rust removing liquid. This worked out really well. It took about 48 hours until all the rust was gone. 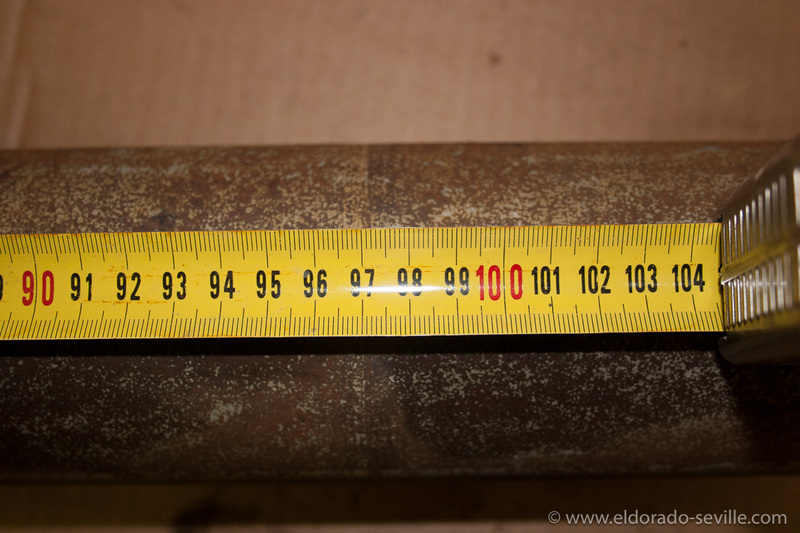 After a little of the rust was gone I discovered the remains of the 3 factory markings on the drive shaft. 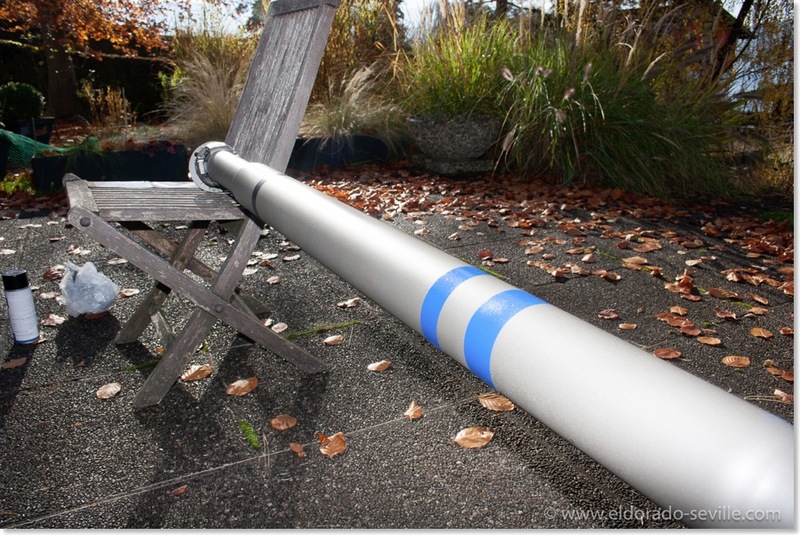 There were three rings painted onto the shaft - two in blue and one in black. I found some small traces of the paint during rust removal. 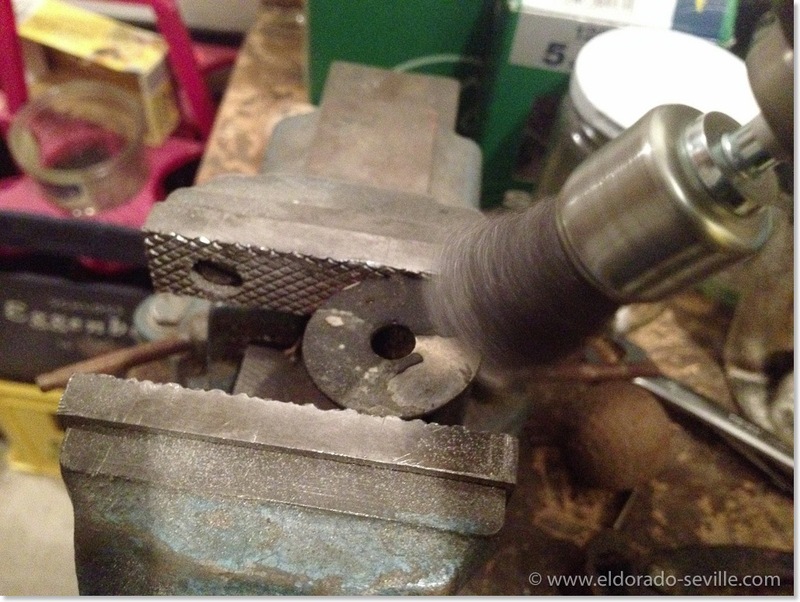 I wanted to re-apply them once the shaft was finished. 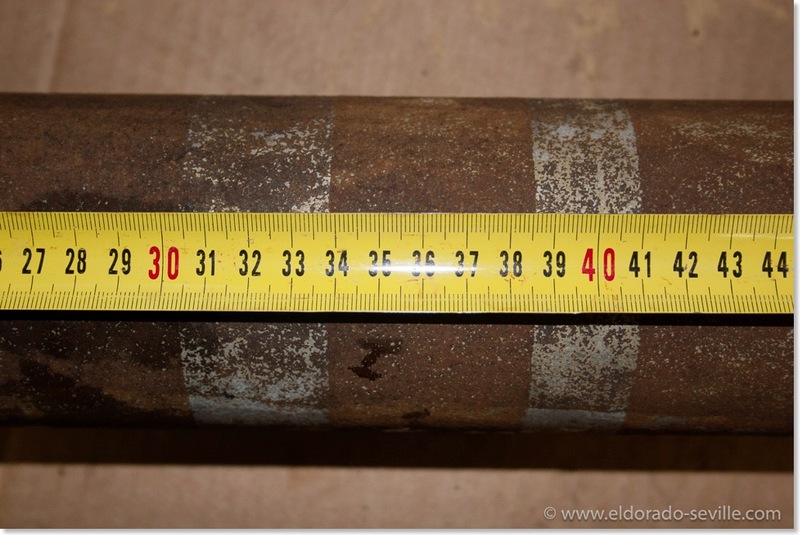 When the shaft was fully de-rusted I found out that flash rust would come back literally after only a few minutes. 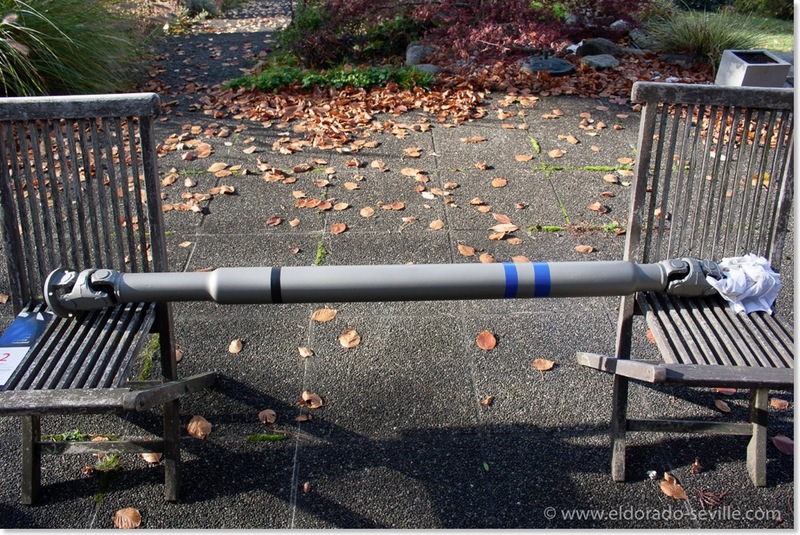 Thats why I decided to paint the shaft to replicate the factory appearance. I used Eastwood Detail Gray to mimic the original look of bare metal. Before applying the paint, I used self etching primer on the bare metal. When all the paint was dry, I added the finishing touches with the three color rings. I´m very happy how it turned out - it looks great. You can see more pictures of this project here. The location of the first two factory markings. 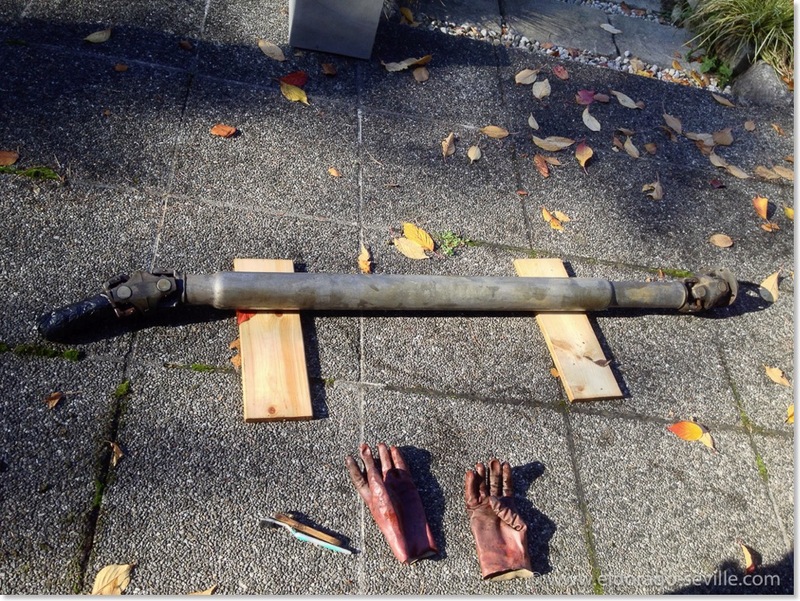 I measured them to make sure that I could replicate them when I painted the driveshaft. The first two markings were (light) blue. The location of the third factory marking. 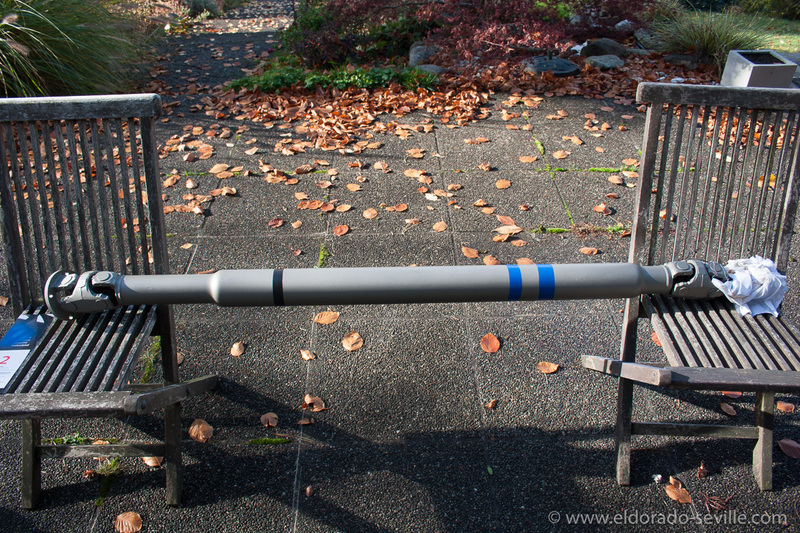 I measured it to make sure that I could replicate it once I painted the driveshaft. This marking seemed to be black once. 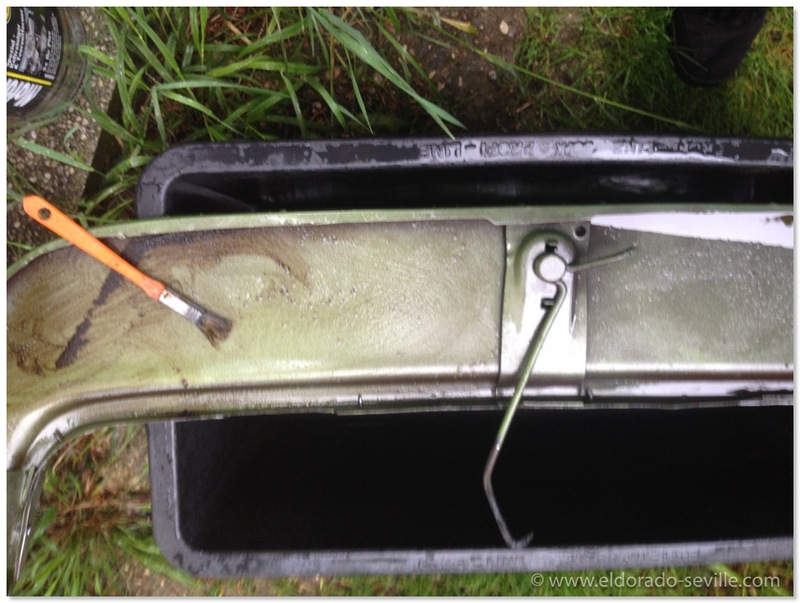 I soaked the driveshaft for 48 hours in rust removing liquid and used these two brushes to agitate it into the rust. This is how it looked after soaking for 48 hours. All the rust was completely gone and only bare metal was left. 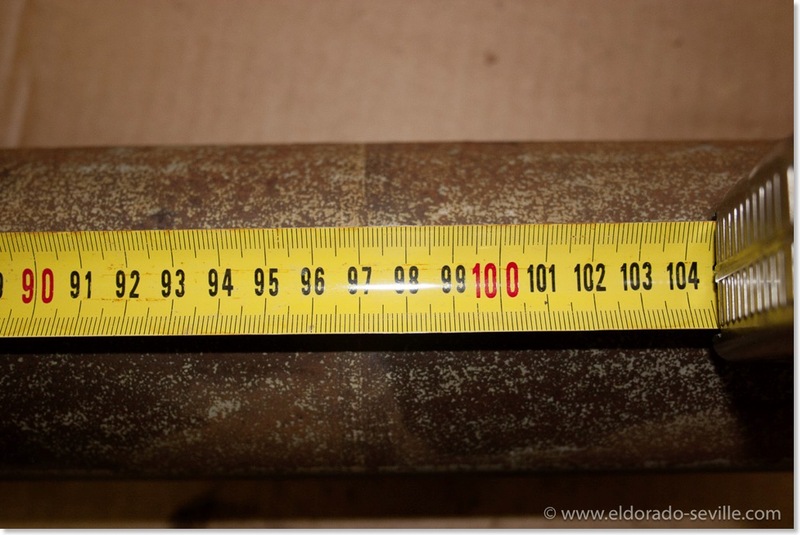 The replicated factory markings on the drive shaft. The correct shade of blue color was only a good guess - I think it comes pretty close to the traces of paint I had found. Back in the car to be able to move it around. 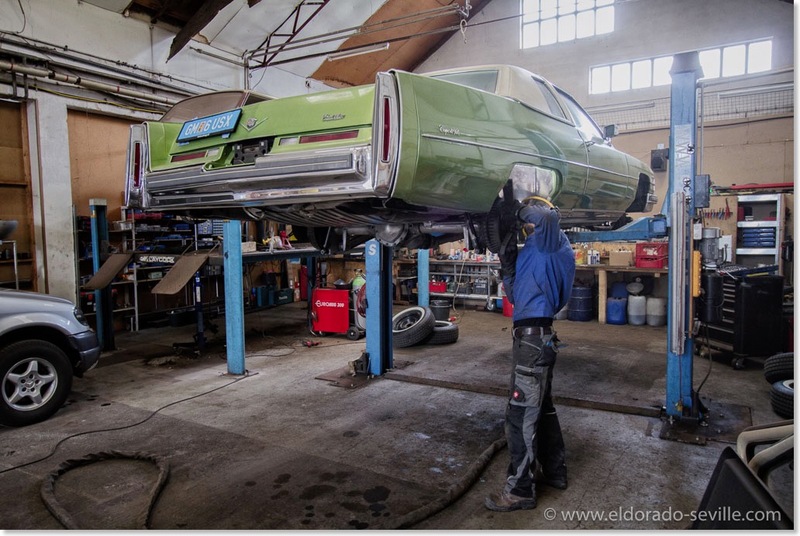 I´m restoring the undercarriage of my 1974 Cadillac Coupe DeVille. See below. 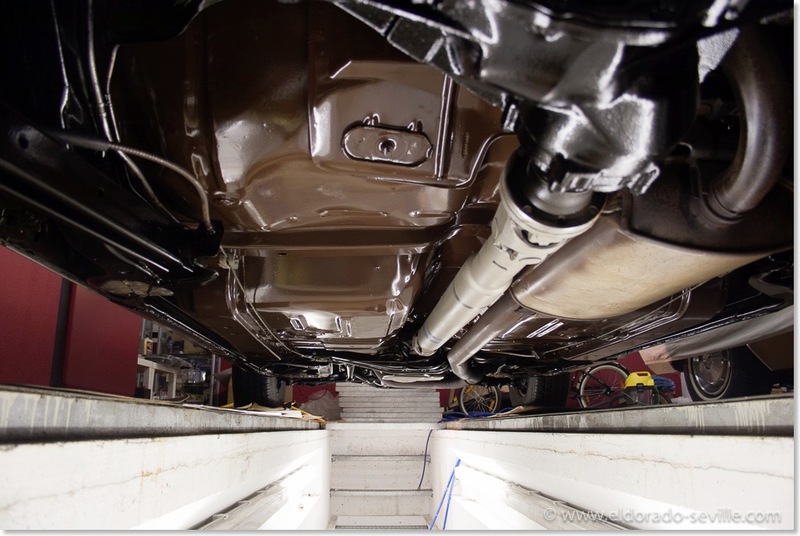 As I want to do it as perfectly as possible, I wanted to remove all the undercoating which was applied when the car was new. 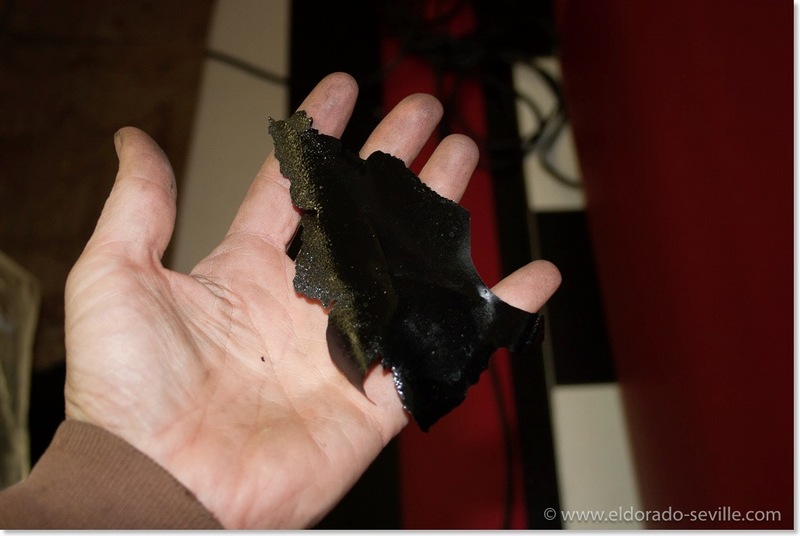 I do not like rubberized undercoating, as you cannot see whats going on underneath. 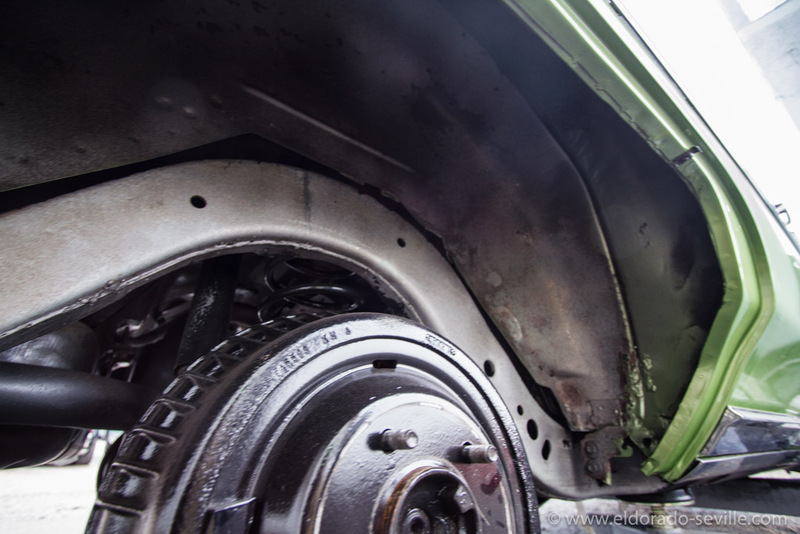 It can trap moisture and once it flakes off due to corrosion, there is already some major damage in the metal underneath. There are different methods for removing the undercoating and most of the methods are a pain in the a**. As I did not want to use any of the methods mentioned above, I decided that I wanted to try dry ice blasting. Dry ice-blasting is a form of carbon dioxide cleaning, where dry ice, the solid form of carbon dioxide, is accelerated in a pressurized air stream and directed at a surface in order to clean it. An alternative media for non-abrasive blasting is water-ice, known as ice blasting. The method is similar to other forms of abrasive blasting such as sand blasting, plastic bead blasting, or soda blasting but substitutes dry ice as the blasting medium. 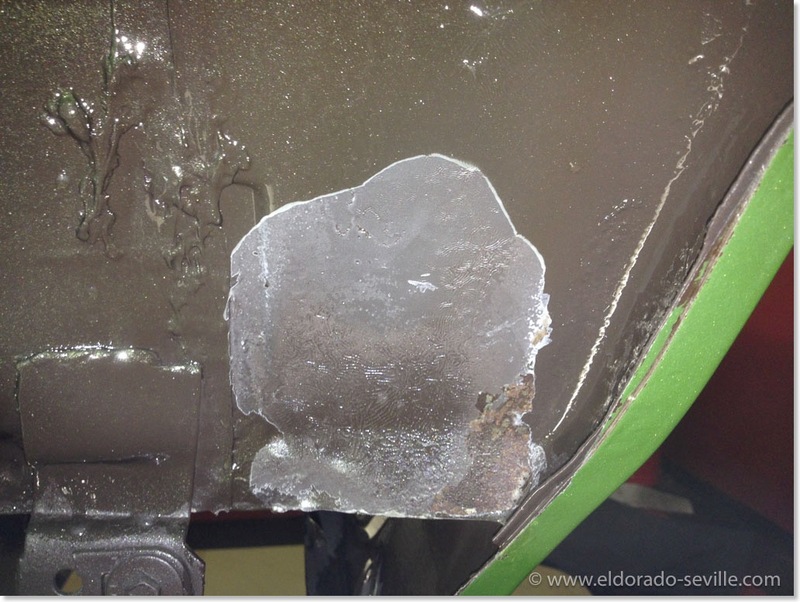 Dry-ice blasting leaves no chemical residue as dry ice sublimates at room temperature. 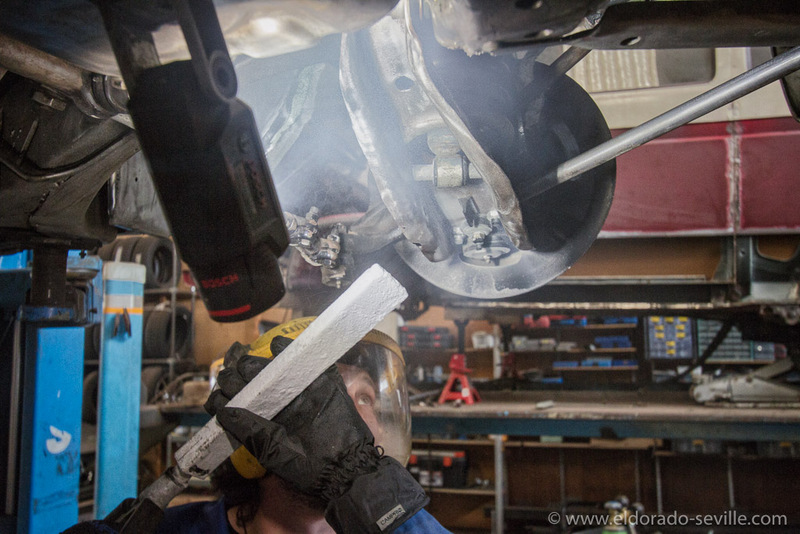 Dry-ice blasting involves propelling pellets at extremely high speeds. The actual dry-ice pellets are quite soft, and much less dense than other media used in blast-cleaning (i.e. 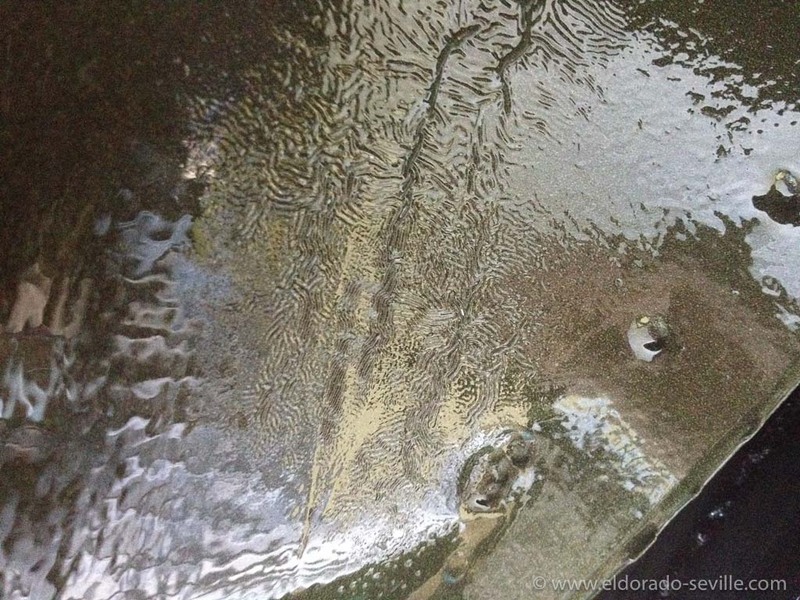 sand or plastic pellets). Upon impact, the pellet sublimates almost immediately, transferring minimal kinetic energy to the surface on impact and producing minimal abrasion. The sublimation process absorbs a large volume of heat from the surface, producing shear stresses due to thermal shock. This is assumed to improve cleaning as the top layer of dirt or contaminant is expected to transfer more heat than the underlying substrate and flake off more easily. The efficiency and effectiveness of this process depends on the thermal conductivity of the substrate and contaminant. The rapid change in state from solid to gas also causes microscopic shock waves, which are also thought to assist in removing the contaminant. 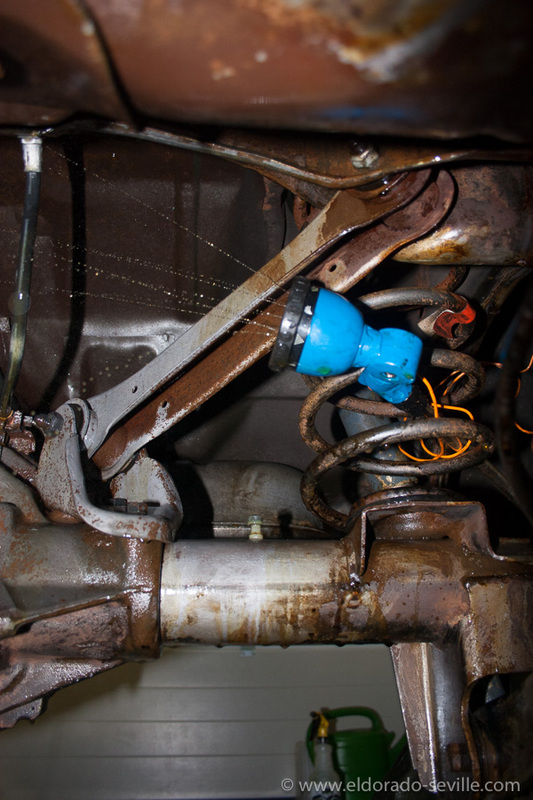 Unlike abrasive media blasting you cannot remove rust with dry ice blasting. I found a company through the website of a classic car club, which is only a little over an hour away. 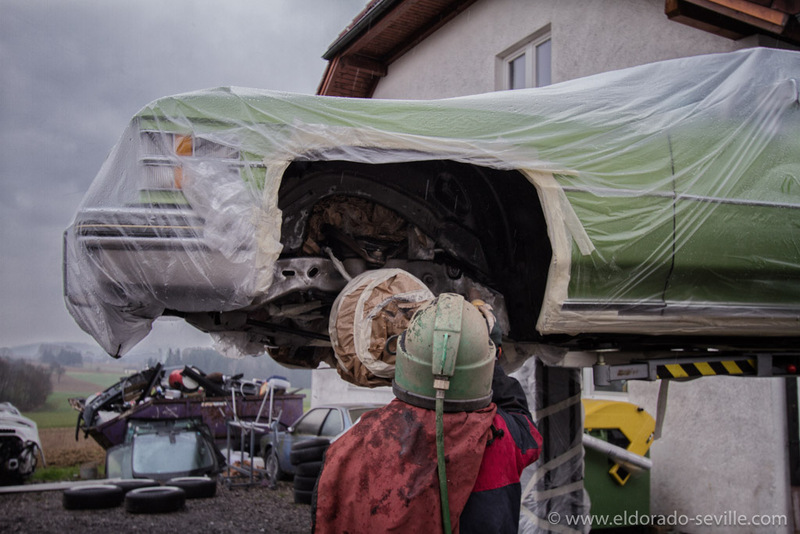 I wanted to have it done before the first snow and as soon as possible, so that I could continue working on my car during the winter. The owner of the company did a great job. He is a very friendly and competent gentleman and it was a pleasure working with him. You can find all the pictures I took today in my restoration album. The car was lifted with a forklift and then covered in plastic. 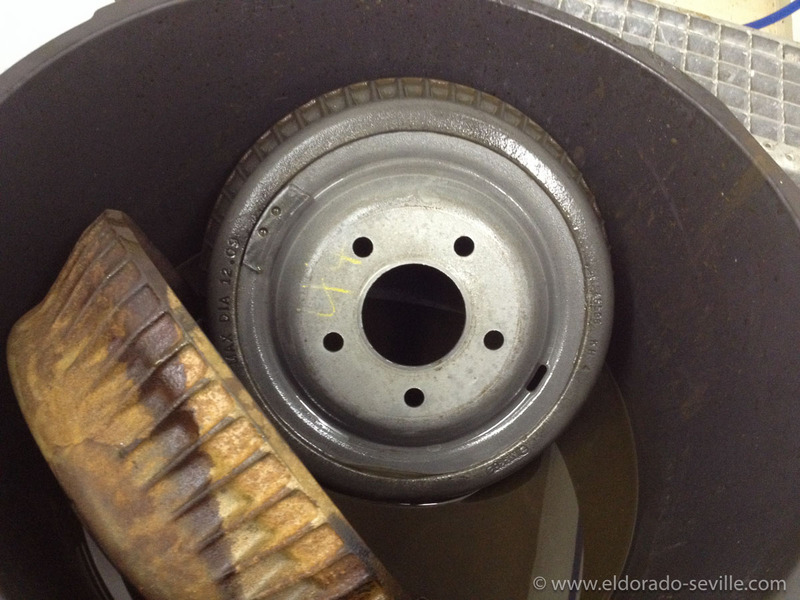 One of the rear wheel-housings before blasting - you can see the undercoating everywhere. The same wheel housing after blasting - all the original paint was still very well preserved under the undercoating. 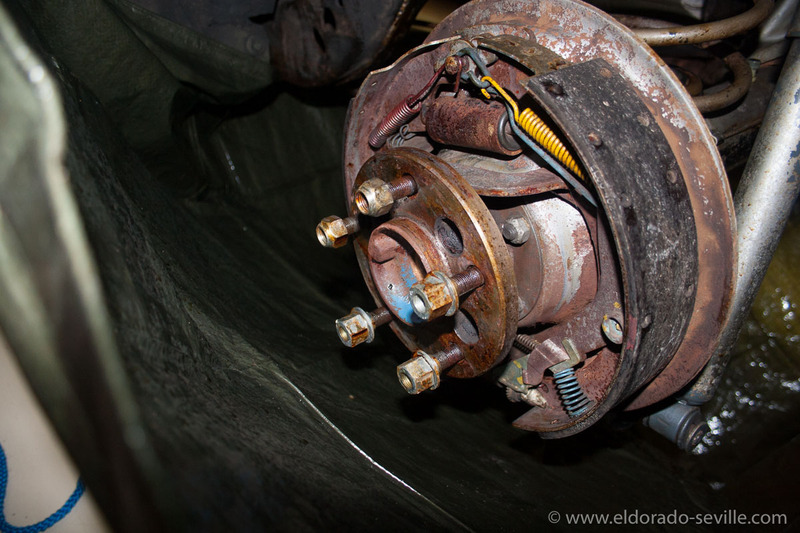 As you can see originally the wheel housing was brown. During painting a lot of overspray from the body landed in the wheel housing. 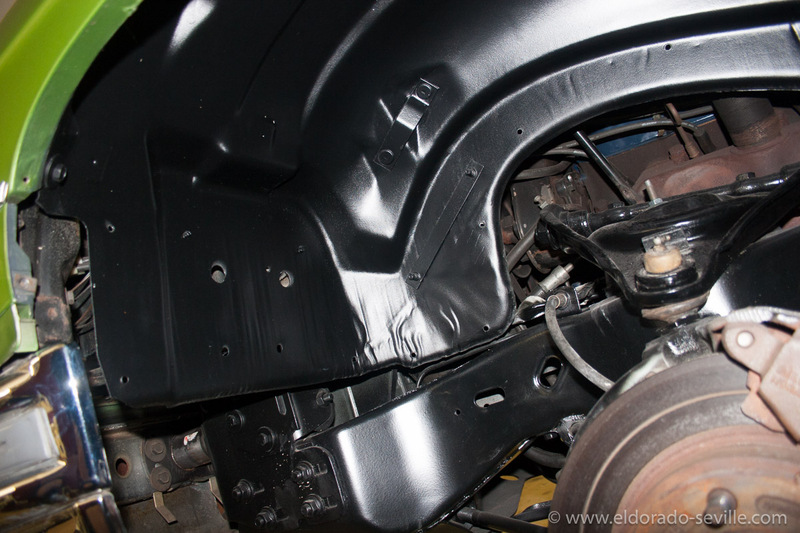 Then Cadillac added rubberized undercoating to protect the metal from stone chips and to keep the car more quiet. Luckily there is no rust to be found anywhere. The original brown paint showed up underneath the undercoating. The paint is still in perfect condition. The original paint showed up underneath the undercoating in the wheel housings as well. After cleaning - it came out really nice! I will touch up some areas and conserve the others with a special transparent coating. I´m very happy with the result of the cleaning and will now have to protect everything and paint some areas.